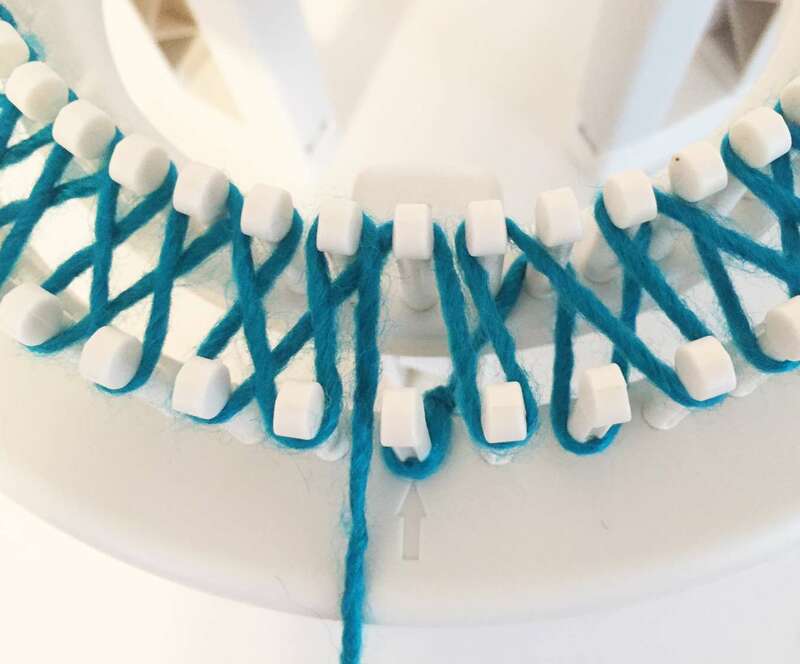 Browsing articles in "Double Knit 101"
Now any loom can rotate on an elevated base! 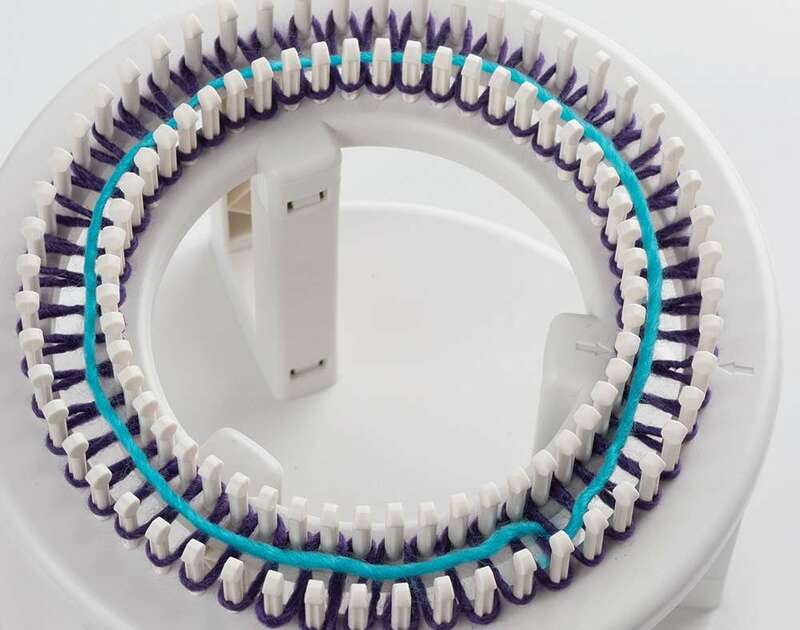 The Loom Holder Connectors convert the ‘Rotating’ Double Knit Loom base into a Universal Loom Holder. 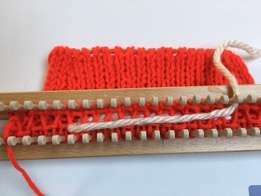 The loom holder consists of a leg connector, and a ‘tray’. 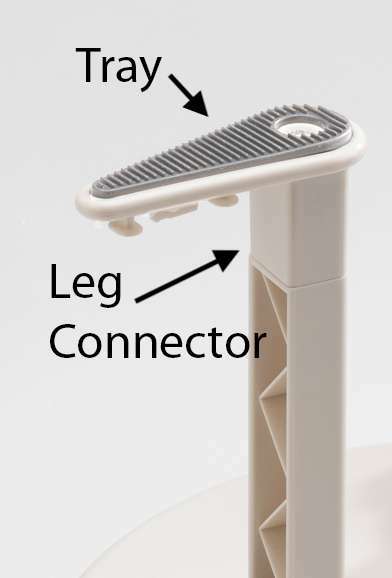 Each holder connector snaps onto a leg of the rotating base. The ‘tray’ or, top part of the connector, holds the loom. The trays rotate around to adjust to each loom. This allows the holders to work with various loom sizes. The connectors are very strong and sturdy. 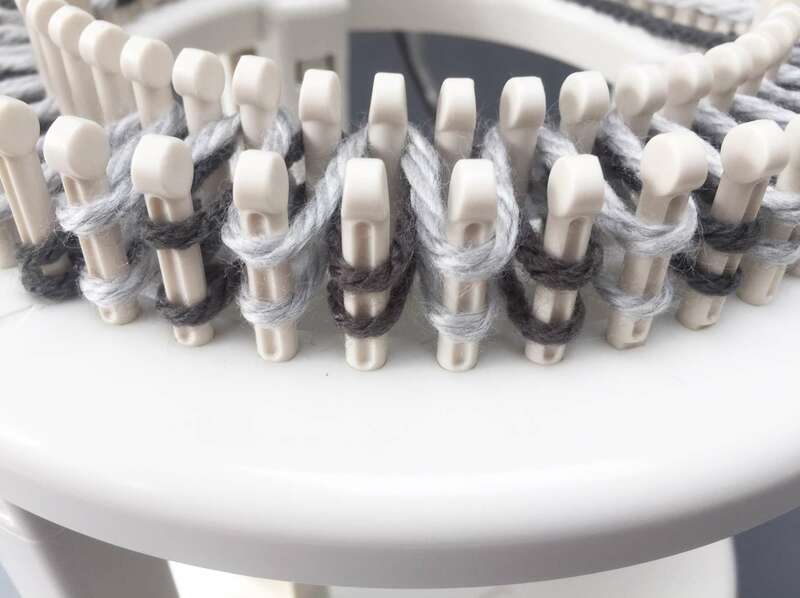 To begin set up, simply evaluate your loom size, and insert the 3 legs into the rotating base using either the outer, or the inner openings on base. 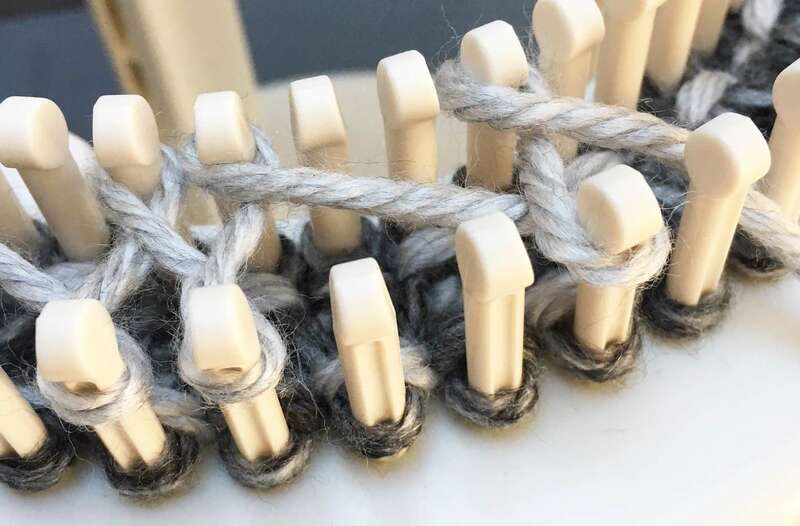 If you are setting up a large round loom, the outer leg locations work best, and smaller looms use the inner leg locations. Rotate the trays to best position to fit your particular loom. Now take your loom and set on top of the 3 trays. 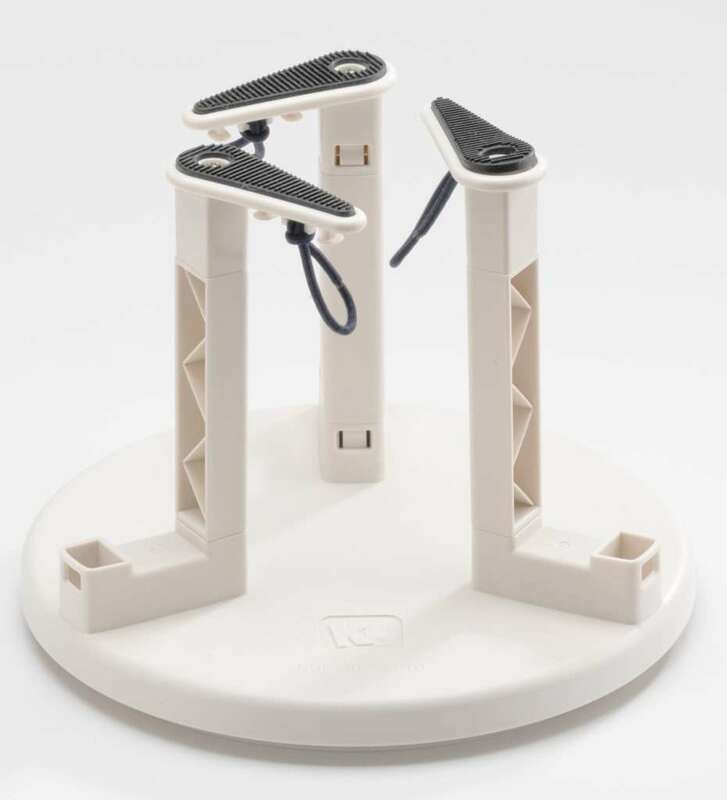 Turn and adjust the trays so that they are balanced with the rotating base. Once loom is placed comfortably on trays, simply wrap the fabric bands around loom and secure to bottom of tray. The bands will hook over one of the knobs, located on bottom of the tray. You can use your fingers or knit hook to attach bands. 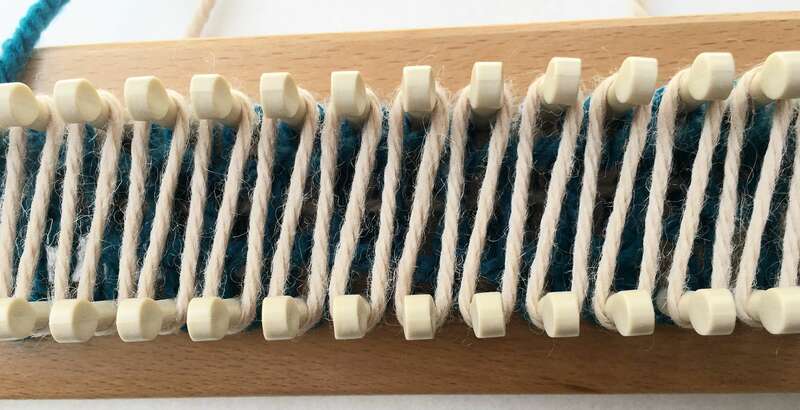 If you are working with a larger loom with wider base, for example, the afghan loom, remove the small fabric bands and replace with the larger fabric bands that come in the kit. 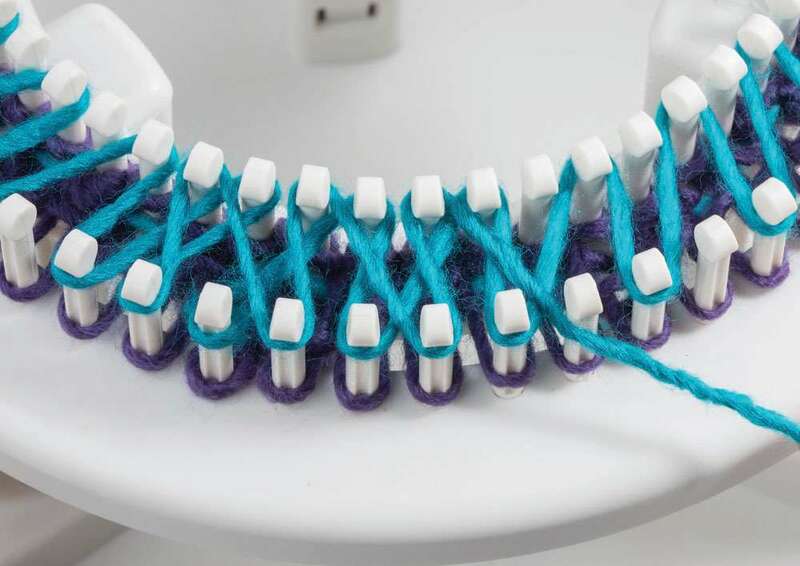 The connectors work to hold many loom shapes and sizes. WOW! This is just wonderful news. Thank you to the folks at Knitting Board! OMG!!! 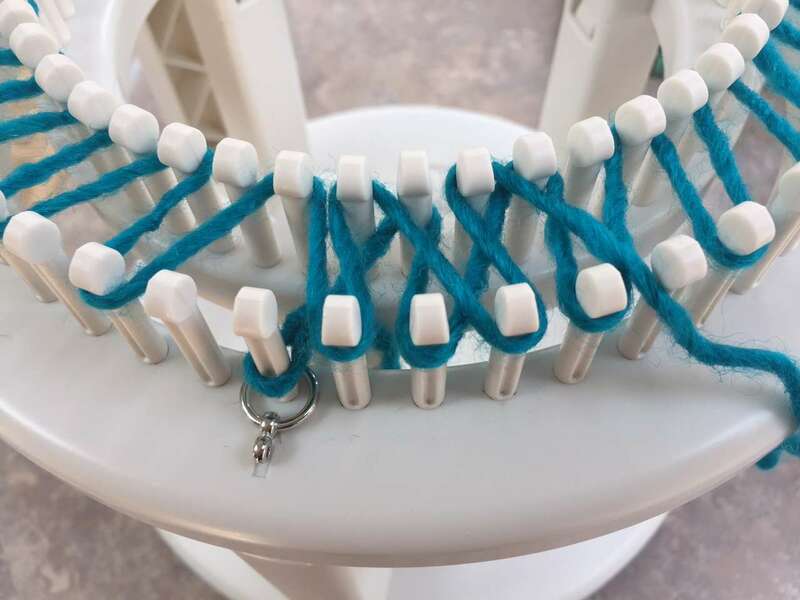 I had asked you if you could make a rotating loom with 36pegs, and if not, could you make something rotating to hold looms. You answered back by saying to watch for something new at the end of the year… And you did it. Actually you made 2 new items, but you made the rotating loom bigger, not smaller. But, unfortunately, I cant purchase both items because they are a little to pricy. 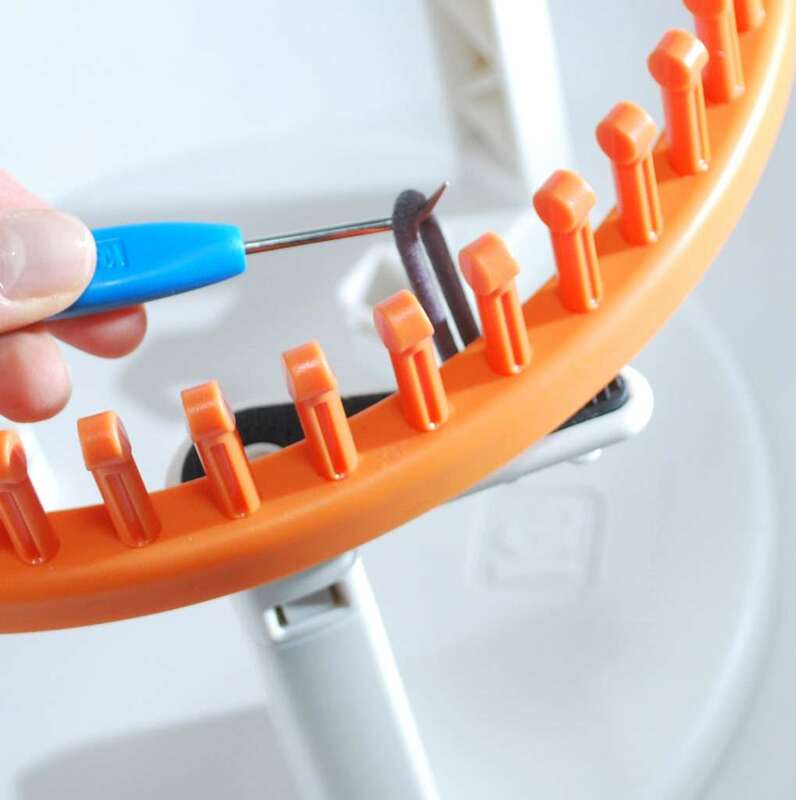 I will not use the original loom that comes with the rotating base, so it would be a waste to purchase it. All in all, it is a terrific new concept. Can the looms that are made for the rotating loom, be put on this one? I Have the orginal and just bought the new one Without the base). Was wondering if it can be put on this so that I can have 2 projects going at the same time. I like it! I have enjoyed all the looms I have purchased over the years. This is the best idea so far. As soon as Christmas is over, I’m purchasing this! Brilliant! This will help me continue to work a a blanket using the S KB loom? 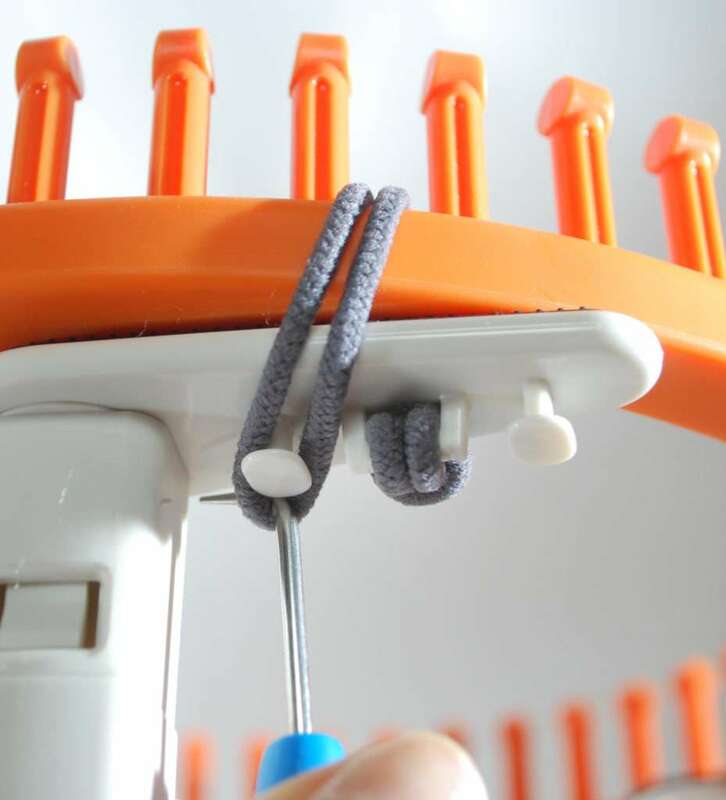 I have made a similar set up with some blocks on my KB rotating loom so I could use my KB orange loom, and it worked, but I seriously love what your team came up with, and would love to give these a try? Thanks to your team for always coming up with great ideas? Where is the add to cart? Can’t find the option to buy…. This is an awesome idea! When will it be available? 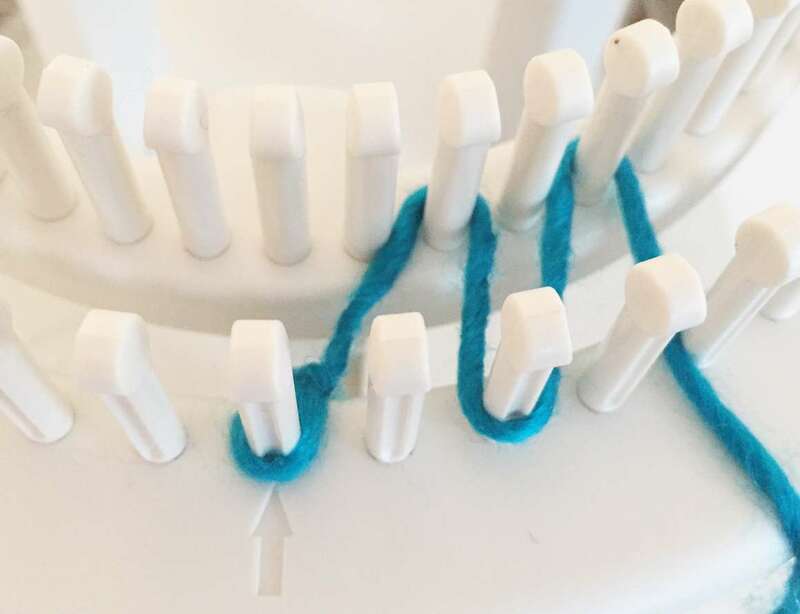 Can I use the rotating connectors on a loops and thread s loom ? is the small loom on the Rotating Loom the hat size for a baby? Do you have a bigger floor version? I have a set of the table top connectors. 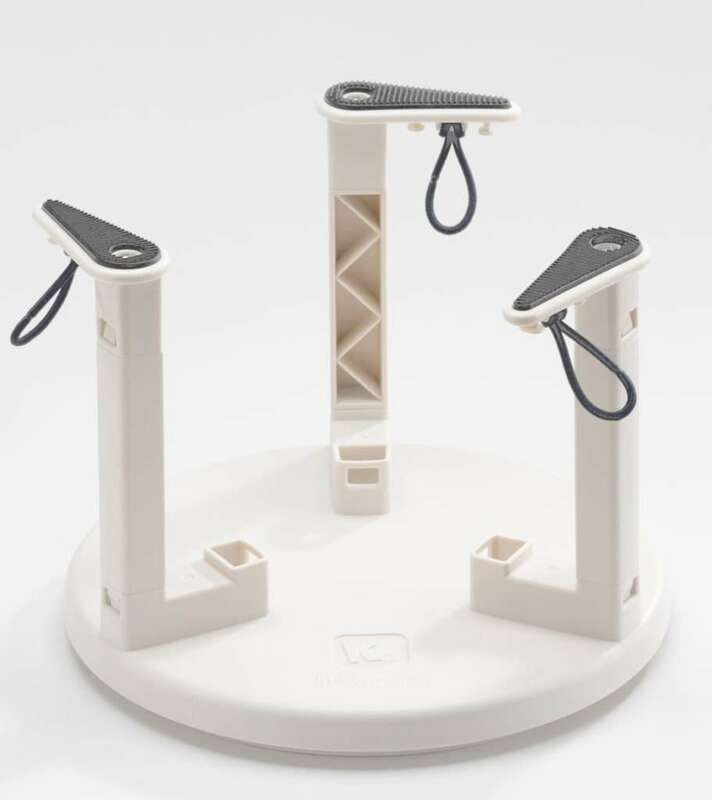 Will you be selling the loom holder and connectors separately? 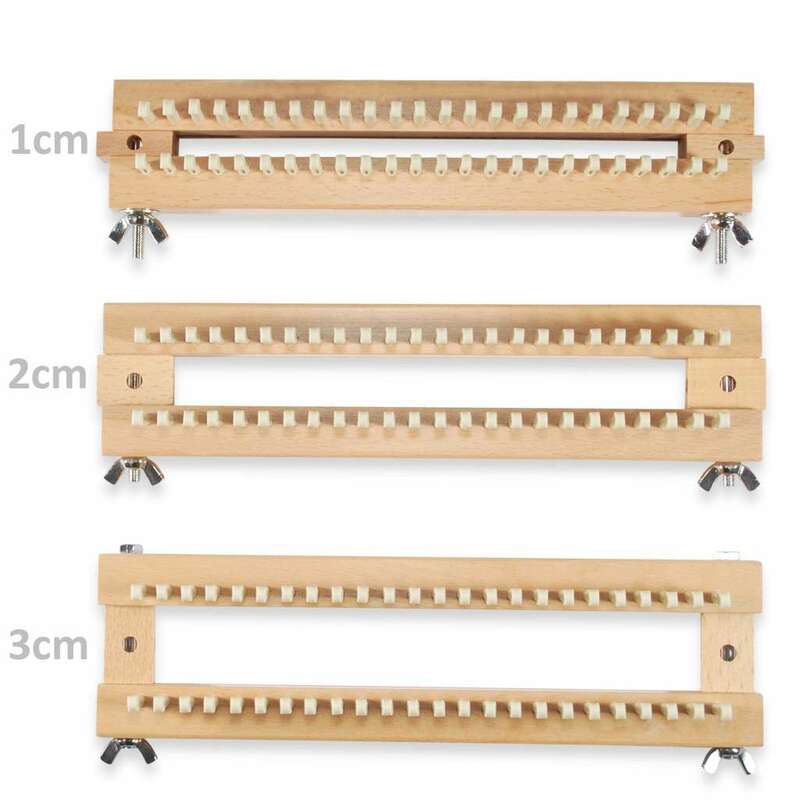 I do not need anymore looms, but I would really love to have the holder and connectors and would purchase them immediately if they became available. Buying more looms would just be a waste of money for me as I have all I need or want. Just the holder and connectors would be wonderful. Lots of stripe s, all ways – vertical and horizontal! 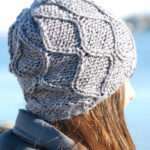 This is a fun hat for any level of knitter. Choose your favorite color combination, and let the stripes begin! Yarn: Two different yarns used in sample, both #5 Chunky. Premier Serenity Chunky, Smoke Heather, 1 skein. Red Heart Soft Essentials, Greyhound, 1 skein. Both yarns are 100% Acrylic and machine washable. Vertical stripes: These rnds are worked with both yarns, always covering the same pegs with each yarn. 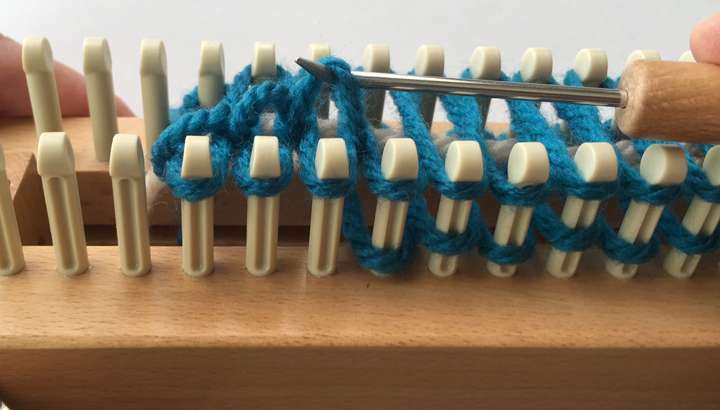 To cast on the loom, create a separate slip knot with each yarn. Place first yarn slip knot on beginning peg. Wrap around loom with first color. Then with second round, attach the second color on first peg on inner loom (opposite the loop knot with first color). Wrap around loom, covering pegs skipped in first round. Each round will end with one yarn coming from the outer loom, and one yarn coming from the inner loom. Repeat process covering all pegs with 2nd loop (see photo). Then hook over the bottom loop over top loop. Cast On 52 stitches in Stockinette with both yarns to create the vertical stripes. Lay anchor yarn. Rnds 1- 8: Work in Stockinette with both yarns in vertical stripes. Double Vertical Stripes: Rnds 15-19 (5 rnds) will be in Figure 8 stitch. Lay yarn 2 aside and work full rnd with yarn 1, on every other 2 stitches. Wrap front to back of same stitch working 2 stitches, skip 2 pegs, and work next 2 pegs. Wrap each stitch in direction like the number 8. Keep this process going until you have a full rnd and are back to beginning. Lay yarn 1 aside and work the round covering the skipped stitches, front to back, in Figure 8 with yarn 2. Rnds 20-22: Cut yarn 1 and tie off with yarn 2. Work 3 rnds in Stockinette with yarn 2. Rnds 23-25: Place a new loop knot of yarn 1 on beginning peg and work in Stockinette for 3 rnds. Next 12 rnds: With both yarns attached and on beginning pegs, repeat the vertical stripes as in the first 8 rnds. Rnd 38: Lay yarn 2 aside and work one rnd with yarn 1 in Stockinette. Cut yarn 1 with 2-3” tail. Rnd 39-44: Knot yarn 2 with yarn 1 tail. Work in stockinette with yarn 2 for 6 rnds. 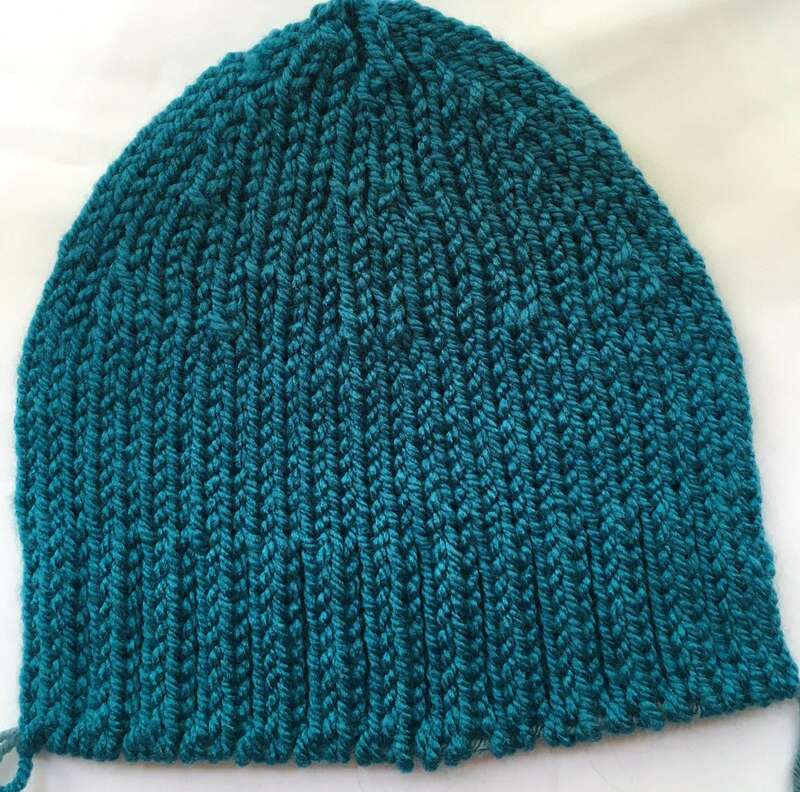 Hat should measure 9.5”-10” high and you are ready to bind off, and close up the hat crown. Bind Off: Cut yarn 2 with aprox 20” yarn tail. 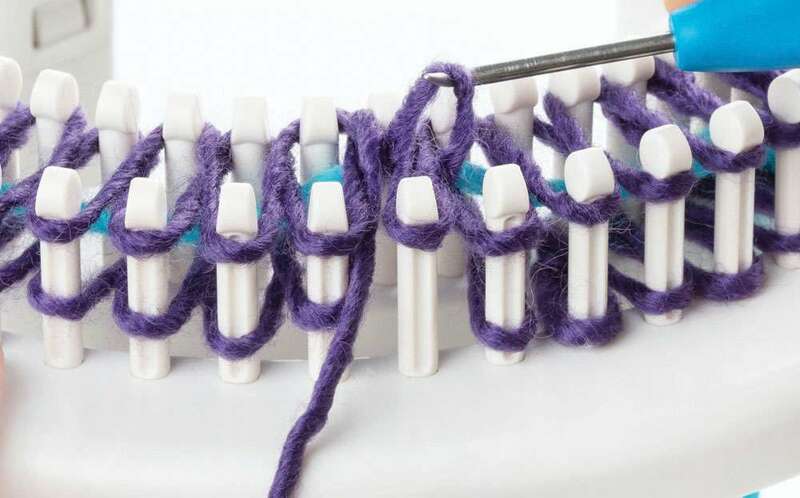 Gently pull stitches snug on pegs. Move the loops from inner loom to same stitch on outer loom, so that the inner loom is empty. 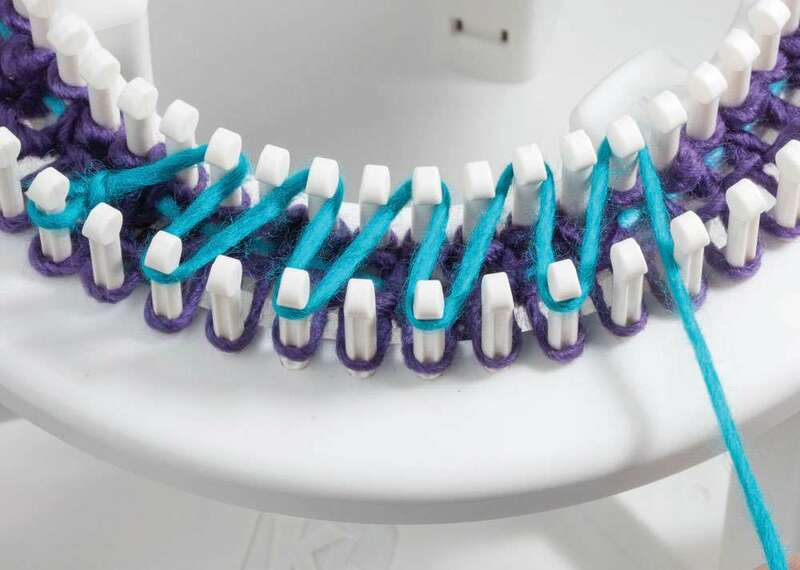 Hook over each stitch, so that you have just one loop on each peg on outer loom. Place the yarn tail on large darning needle. You will be transferring the loops onto the yarn for the gather bind off. Moving from R to L, insert the needle thru the loop from underneath and allow it to slide onto the yarn. Remove it from the loom. Pick up next loop and allow it to slide onto the yarn and remove it from the loom. Continue around the loom lifting each loop and transferring it to the yarn, until all loops are on the yarn. The hat is now free of the loom and it can be lifted up and off the loom. Finishing: Leave the yarn on the darning needle. 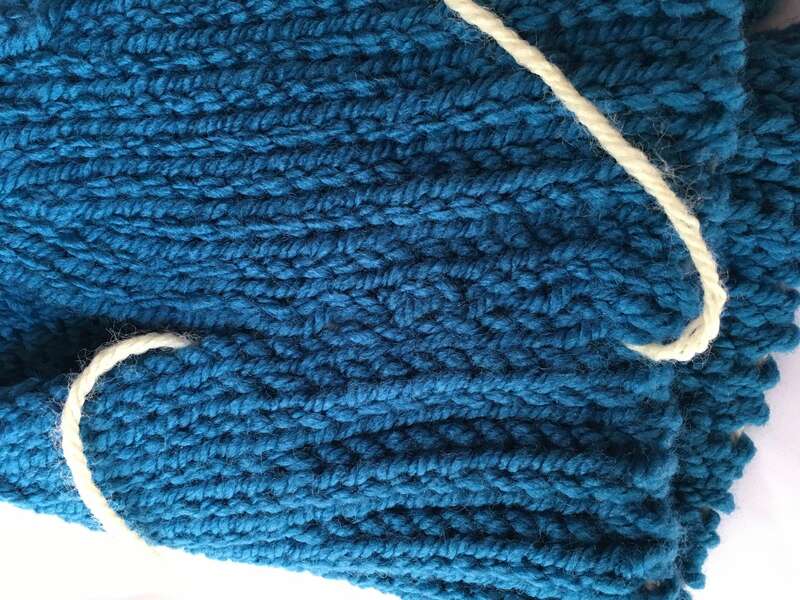 Gently, gather the top edge of the hat by pulling the yarn and drawing the top of hat together. Once the opening is small, you can take the yarn to inside of hat and use the darning needle to sew the hat closed. Knot securely. 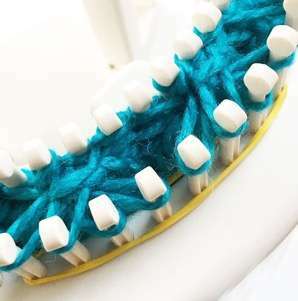 Leave the yarn tail attached to use to sew on the pompom. 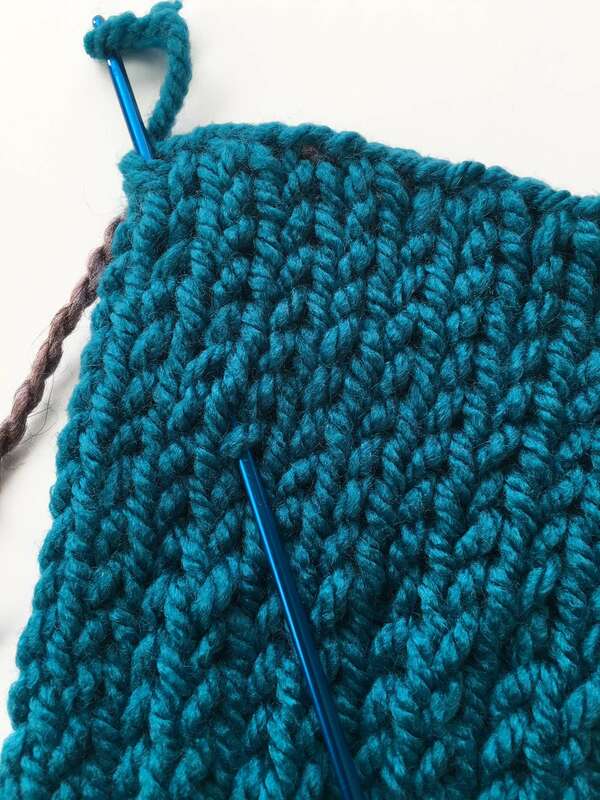 Work a single crochet bind off of cast on stitches using the crochet hook. Be sure to work towards the yarn tail, so that you end the bind off at the yarn tail. Once you have worked all the stitches on the anchor yarn, there will be only the one loop on the crochet hook. Pull the yarn tail thru the last loop to knot. Gently remove the anchor yarn. Weave in all yarn tails that may remain, or pull to inside of hat and trim. This is best done with the crochet hook. Pompom: You will make a crochet chain of each color yarn that is aprox 40” long with the crochet hook. Start with a loop knot, pulled so that it is about the size of a pencil. Insert the crochet hook into the loop, grab the yarn and pull it thru the loop so that you have a new loop. Grab the yarn again, and keep going in this manner to create the chain. Once you have aprox 40” of crochet chain, knot the last loop. Trim ends to about ½”. Repeat the process with the other yarn. Once you have both yarn chains complete, roll them together as if making a Christmas bow. Tie in center and knot. 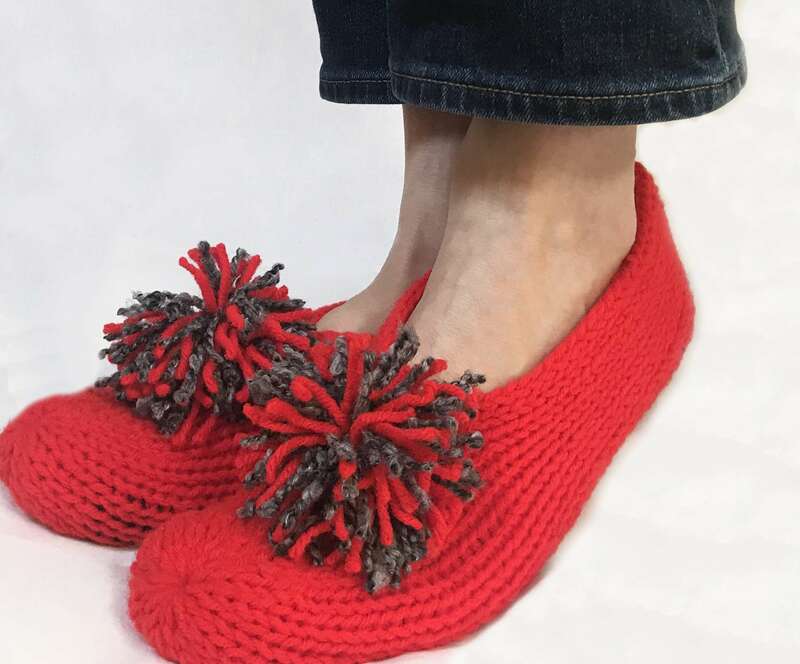 If you would rather, you can make a traditional pompom or tassels. Just have fun with the adornment! Sew securely to top of hat using the yarn tail and darning needle. Cut end of yarn after sewing is complete and weave in yarn tail into the knit, or pull to inside of hat. I love everything about this hat, the color, stripes, the top…so good! Great post! Is there a stitchology for February? Is there a stitcholgy for February? Stitchology has been canceled. Our lovely designer has other wonderful opportunities that she is pursuing. Can this hat be made with #4 weight yarn? 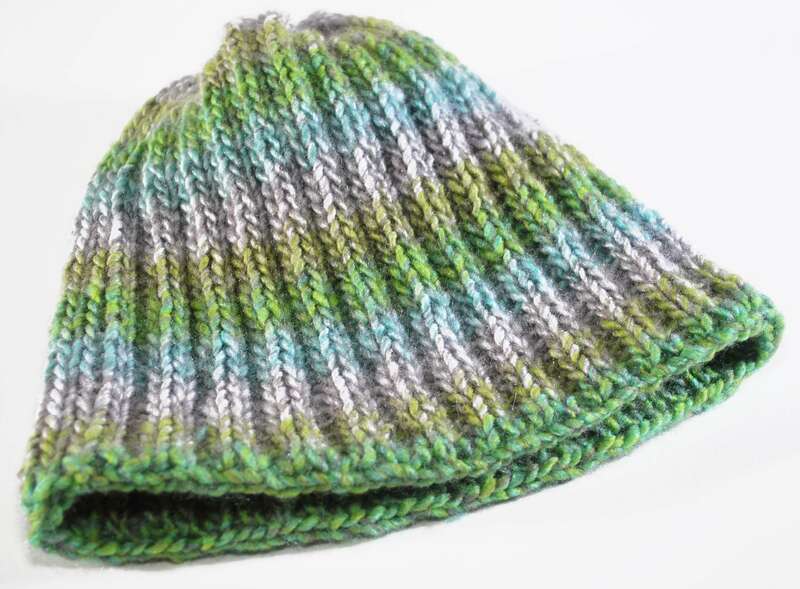 The hat could be done in #4 yarn but the result would be thinner and the change of color may show a bit between the stripes. 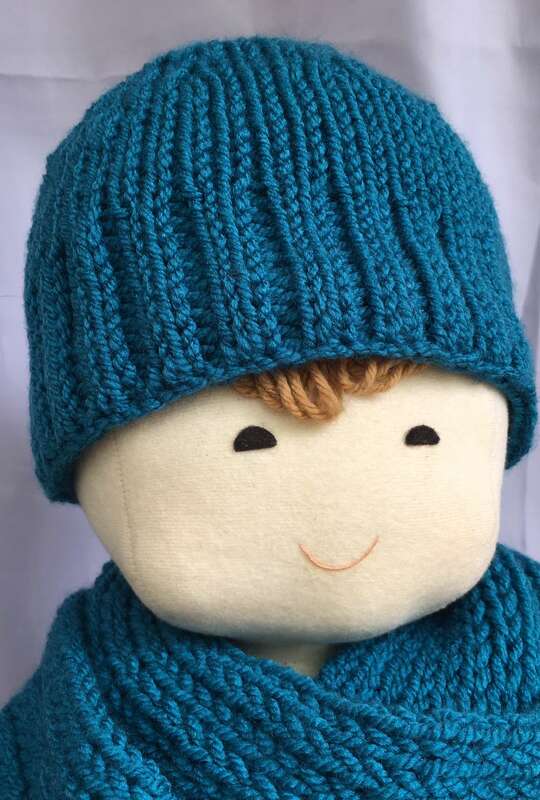 Also, the hat will be a little smaller but will fit head circumference of about 20-21″. 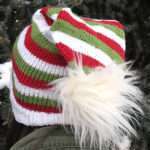 The sample hat fits looser or up to head circumference of 23″. 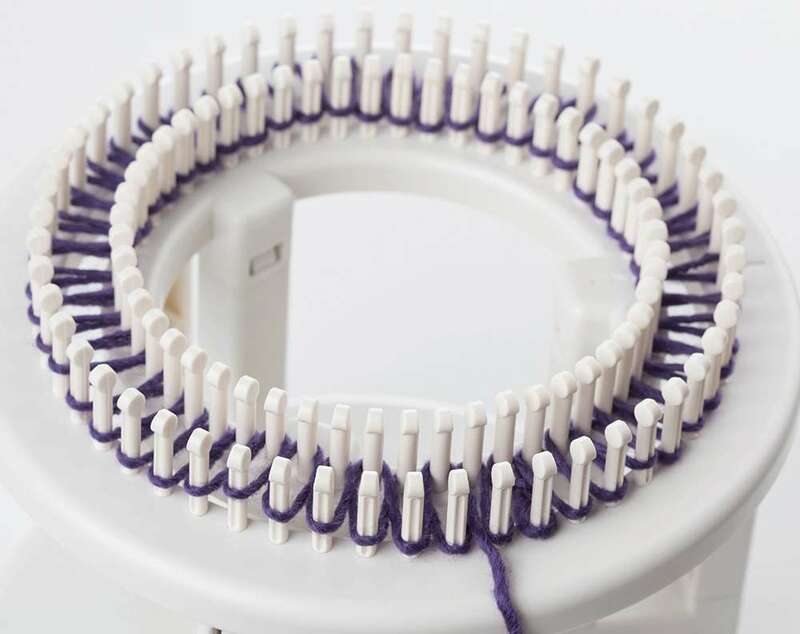 Loom: ‘Rotating’ Double Knit Loom, set for double knit. Yarn: Patons Shetland Chunky, 75% Acrylic, 25% Wool. Hand wash and lay flat to dry. Chunky #5 weight. Color used is 78742 True Peacock. 1 skein or a total of 125 yds. To make a deeper hat, purchasse 2 skeins of Patons Shetland Chunky. Medium Blue, 8 yds for PomPoms, or any accent color desired. Sample worked with 3 yarns of similar color and Medium blue. Size: Hat fits average adult and is 8.5” deep. 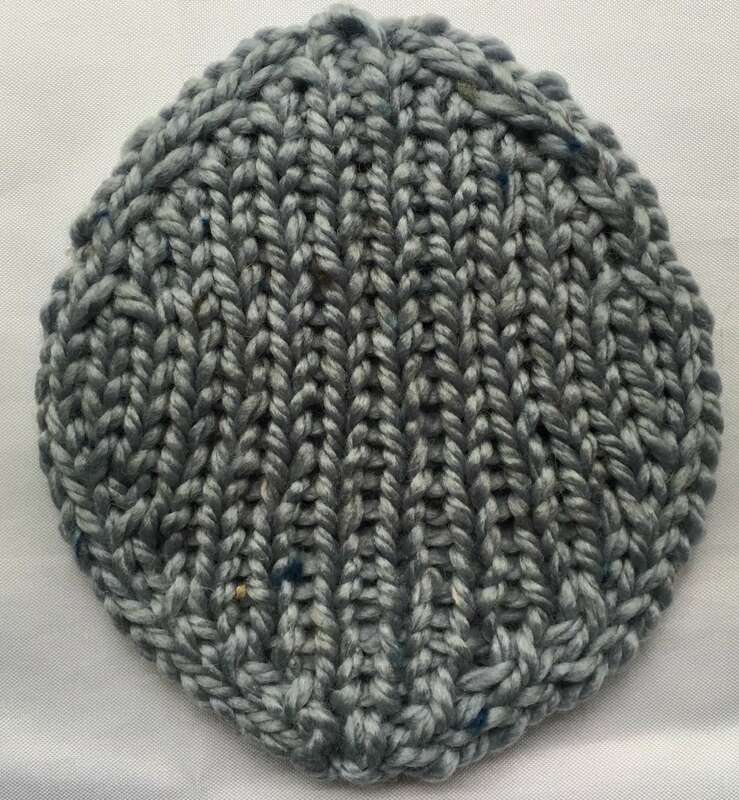 Hat is worked in Rib Stitch. Total of 32 rounds unless deeper hat is desired. Each rib is 2 sts. Cables consist of 8 stitches or 4 sets of Ribs. There is a total of 4 Cable sections in hat. Work Twist #1 on all cables and work round. Work Twist #2 on all cables and work round. Place colored rubber band on each set of 8 sts cables before beginning. There are 4 of these sections. Sequence: 4st, 8 st cable, 6st, 8 st cable, 4 st, 8 st cable, 6 st, 8 st cable. Place one rubber band around pegs for each 8 st cable, for markers. #1 Twist: Each cable design consists of 4 ribs or 8 sts. Be sure to pick up the correct stitches to keep the ribs consistent. Twist only the sts on the outer loom. Place markers or rubber band on each set of 8 sts. Working pegs 1-4. Lift first 2 sts, 1 and 2 (one rib) and hold on double hook. With another hook, move sts 3 and 4 onto pegs 1 and peg 2. Now, place st 1 and 2 from double hook onto peg 3 and peg 4. Working pegs 5-8. Do another twist (2 ribs). Then repeat the process on all sets of 8 sts marked with rubber bands. #2 Twist: Start with 2nd rib. You will be twisting the stitches in the opposite direction. Working pegs 1-4. Lift the 2 sts on pegs 3 and peg 4 and hold on double hook. Move sts 1 and 2 onto pegs 3 and peg 4. Now, place sts from double hook onto pegs 1 and 2. Working pegs 5-8. Lift sts 7 and 8 with double hook. Move sts 5 and 6 to peg 7 and peg 8. Now place sts from double hook onto pegs 5 and peg 6. Repeat this process on all sets of 8 sts marked with rubber bands. Hints: Work in loose tension especially the row before each twist row. Work hook over on inner loom first as this loosens tension. Then, work the hook over on the outer loom. Cast On all 52 pegs to work in the round in Rib stitch. Lay anchor yarn and allow ends to dangle below the looms. Rnds 1-6: Work in Rib stitch for the brim of hat. Rnd 7: Work Twist #1 cable on all 4 cable sections (8 sts each). Weave the round in rib stitch over all pegs including the cable twists and hook over. Rnd 11: Twist #2 cable on all 4 cable sections. Work the rnd in rib stitch. Rnd 15: Twist #1 cable on all 4 cable sections. Work rnd in rib stitch. Rnd 19: Twist #2 cable on all 4 cable sections. Work rnd in rib stitch. Rnd 23: Twist #1 cable on all 4 cable sections. Work rnd in rib stitch. Rnd 27: Twist #2 cable on all 4 cable sections. Work rnd in rib stitch. Bind Off using Rib Bind Off method: Maintain a yarn tail of aprox 12-14”. Keep the 2 rib sts together. Place st 1 on st 2 as if to do decrease. This needs to be the 2 sts of one rib. Do this all around the loom on both looms. You will have every other peg with 2 loops. Lift bottom over top so that there is just one loop on every other peg. 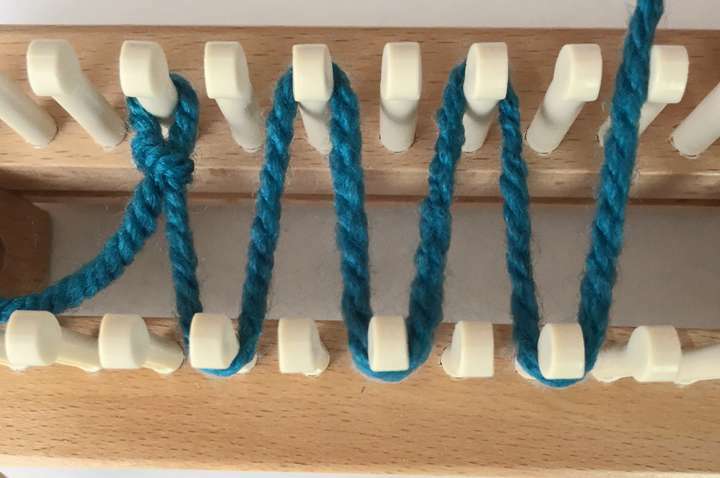 Now, bring the loops from inner loom to outer loom so that there are again 2 loops on every other peg on outer loom. 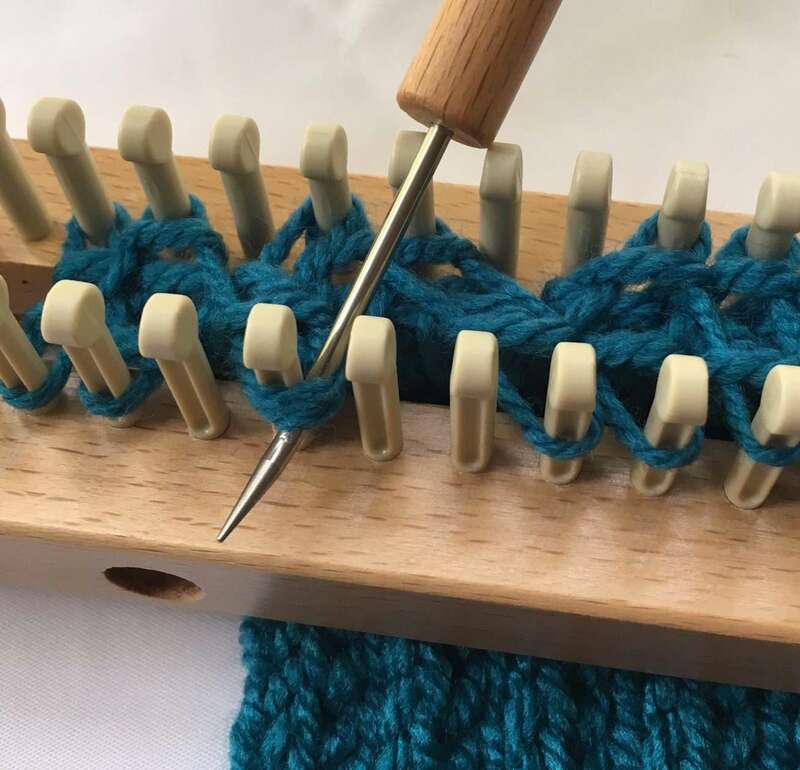 Use tapestry needle and yarn tail to work around the loom and pick up the loops on the pegs, so that hat is free of the loom, and all loops are secure on the yarn. Lift hat off loom. Draw up the top of hat. Go around the top of hat a 2nd time to secure a snug closure. Knot the yarn, and weave in ends. Bind off at Anchor yarn: With the crochet hook, pick up both loops of one rib at yarn tail. Pull one thru the other. Pick up next loop of next rib, and pull one closest to hook thru the other. Do this loosely around entire brim of hat. Once complete, knot last loop with yarn tail and weave in ends. Gently pull out the anchor yarn. 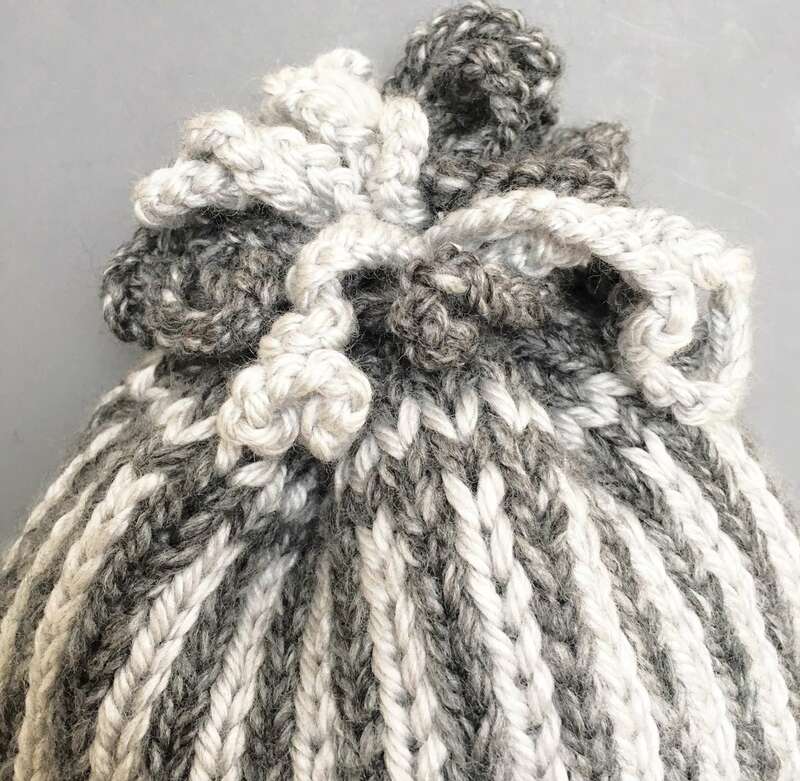 Finish hat with a happy big pompom. Use some different yarns of shades of blue or peacock blue and maybe some different weights. Wrap about 40 times around cardboard. Tie the pompom, cut and trim. Tie to top of your hat for a fun look. Great supportive photos! Thank you!!!!! 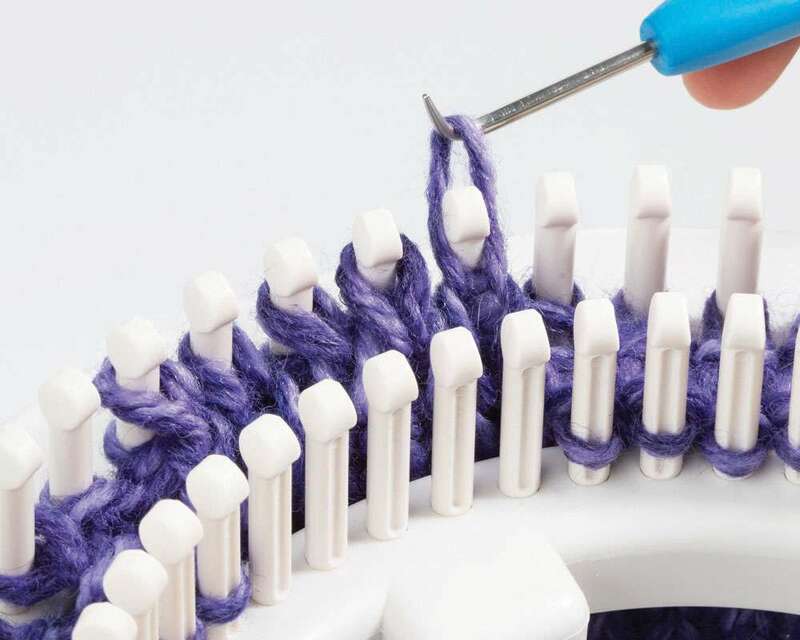 Knitting double knit in the round on the Double Knit Loom requires the regular double knit stitches to be reinvented to work with the circular shape. There has been some confusion concerning the wrap starting on the beginning peg, or not. Originally the Rib Stitch on the DKL was worked NOT starting on first peg, after the cast on. But this made row counting difficult, and didn’t make sense for many knitters. We have revised the RIBBING STITCH in the round to work by coming back around to the beginning peg. This STITCH NOW STARTS ON BEGINNING PEG FOR EACH AND EVERY ROUND. 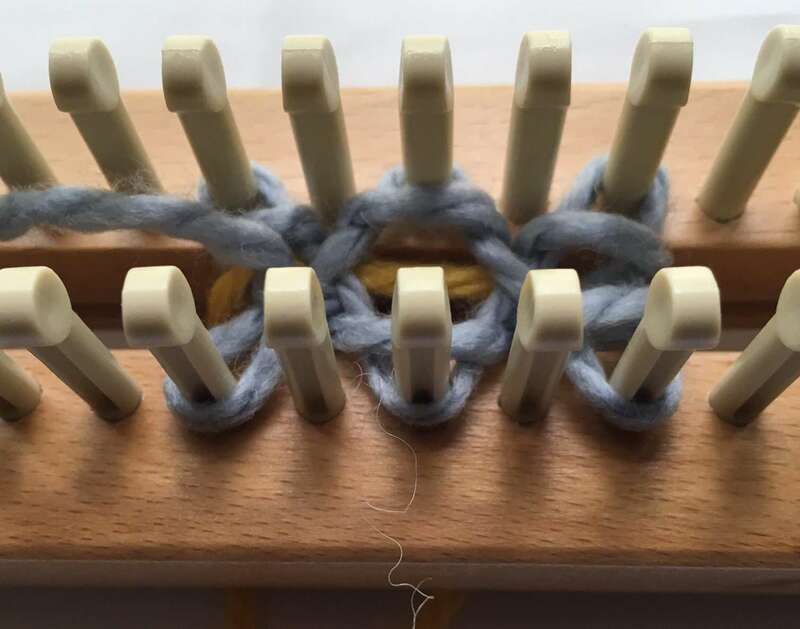 We are using the peg marked with the arrow on outer loom as the beginning peg. 1. Wrap from beginning peg (peg 1) to peg 3 on inner loom. 2 Continue wrapping ‘every other peg’ until you wrap the peg across from the starting peg (starting peg marked with stitch marker). 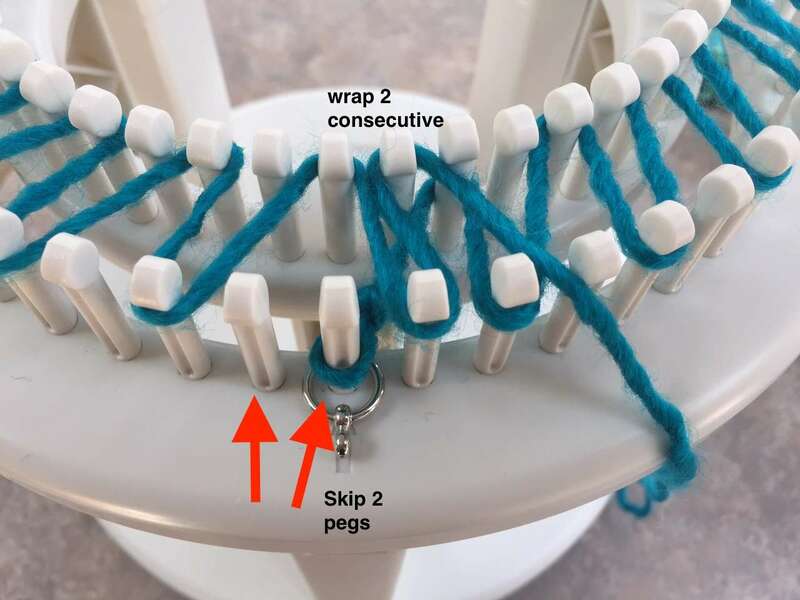 Skip the 2 pegs (marked with red arrows), wrap peg adjacent to the starting peg, then go to inner loom and wrap the consecutive peg. This will change your angle. 3. Then continue wrapping ‘every other’ peg. You will be working in same direction, but at opposite angle. 4. When you end the round, the wrapping should look like photo below. 5. At this point, lay an anchor yarn around the stitches, between the looms, with yarn tails dangling below the looms. 6. Then repeat the process again starting with wrap around the starting peg on outer loom. Once you have two rounds complete, hook over all pegs starting with outer loom. Continue working as many rib rounds as desired or as pattern dictates, always starting on beginning peg. I bought your sock loom the one that you can adjust by skidding the one piece it is plastic. I was watching a video on knitting a sock and the tool that was suppose to come with this loom is not the one I got with my loom. The other one looks like it is a lot Easter to use. Where can I buy one like that. It had an extra little hook on the end. Thank You. 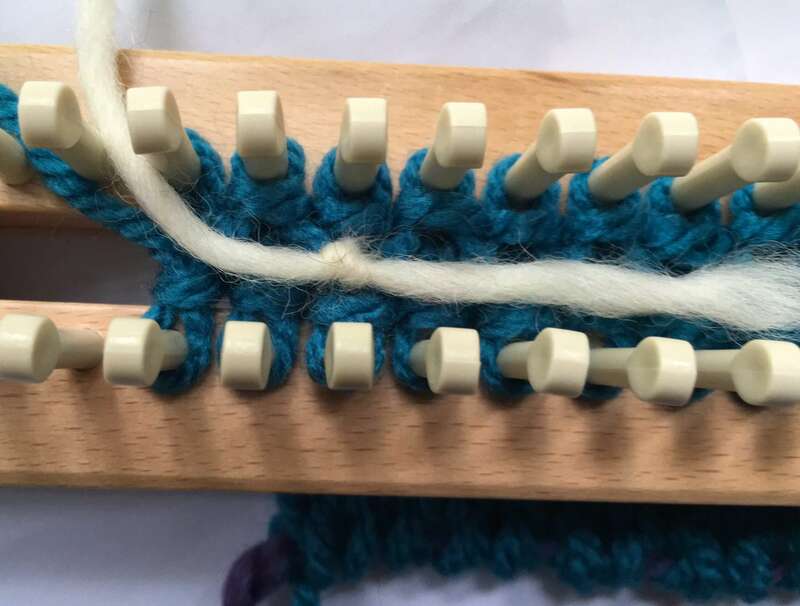 Please contact us at info@knittingboard.com and send us a picture of the knitting tool you receive and we can confirm whether you received the correct knitting tool. 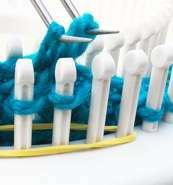 We only have two knitting tools–one with a wooden handle and one with an orange handle; both have only one little hook. 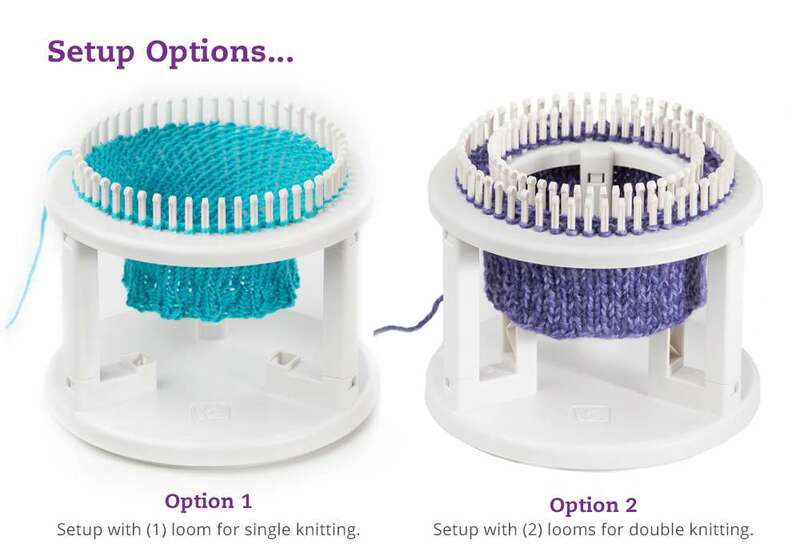 Introducing the new ‘ROTATING’ Double Knit Loom! 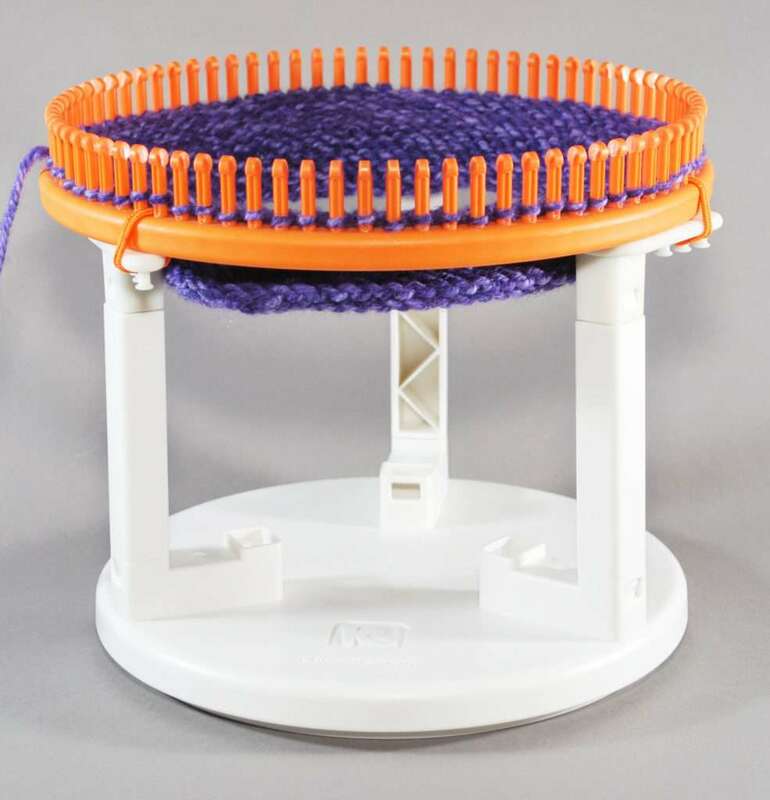 This loom features the new ‘patent pending’ rotating base. 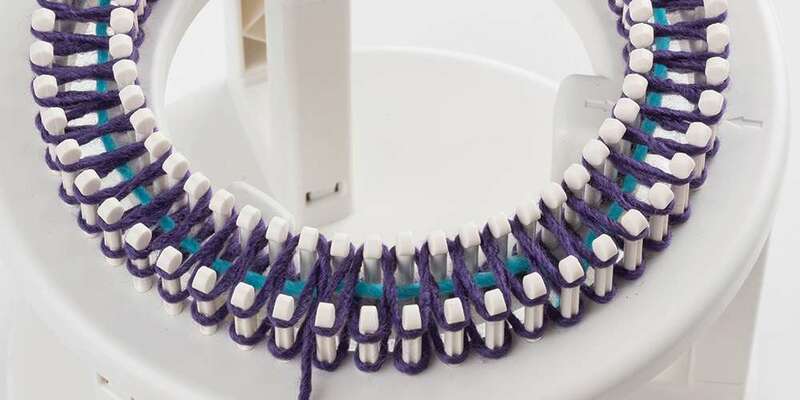 You no longer have to change positions as you knit, the loom rotates as you work! Loom sits comfortably on your lap, or on a table. It’s compact and lightweight …so easy to use. Knit in the round, or knit flat panels. 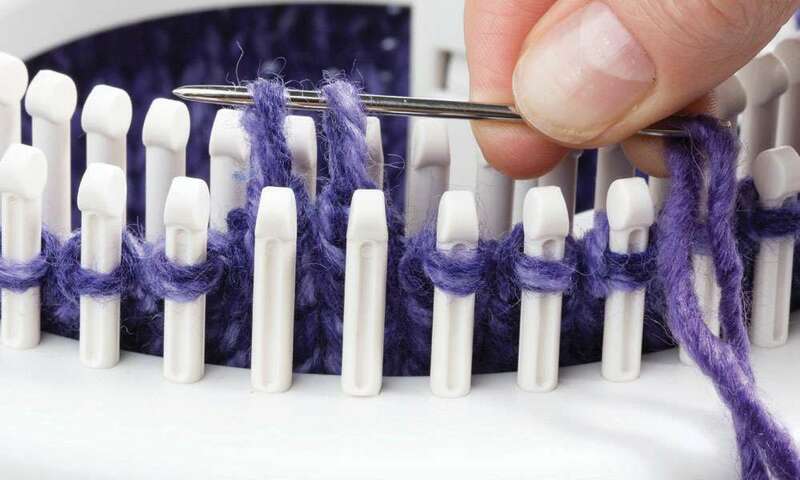 Use some of the pegs, or all 52 of them, depending on width of knit desired. The loom comes in parts for easy assembly: (6) legs, (1) inner loom, (1) outer loom, (1) rotating base, instruction booklet and knit hook. It’s super fast to set up with snap-in-place parts. Set it up with inner and outer loom, and 6 legs for double knitting. Or set it up with outer loom only, using 3 legs, for single knitting. It’s so easy! Made of high quality durable plastic. The booklet will show you how to quickly and easily configure the loom for your project. 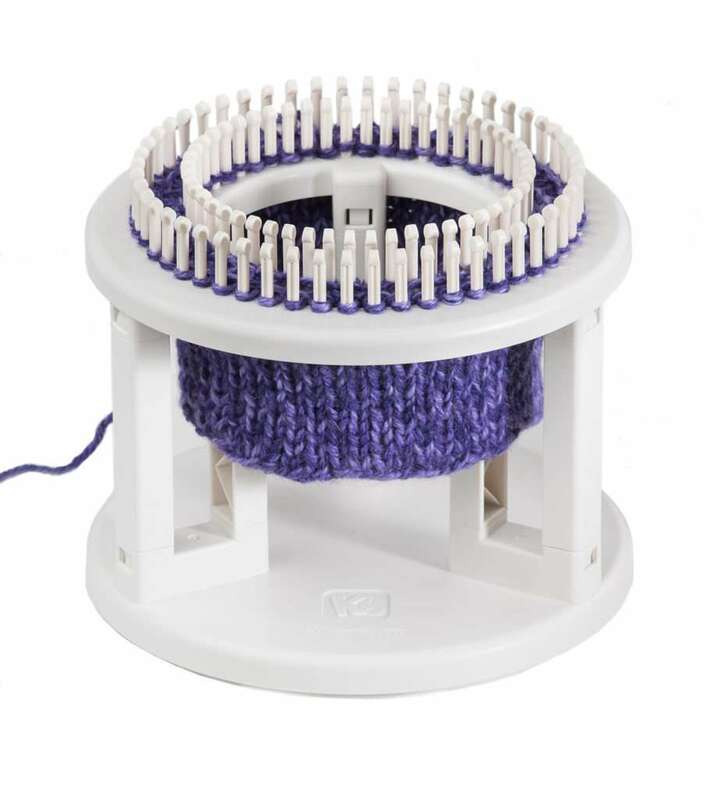 This loom is great for Hats, Scarves, Cowls and Shawls…. whatever, and however, you choose to create; this loom can make creating your project FUN and EASY! Recommend yarn #4 or #5 for double knitting, and #2, #3, or #4, for single knitting. 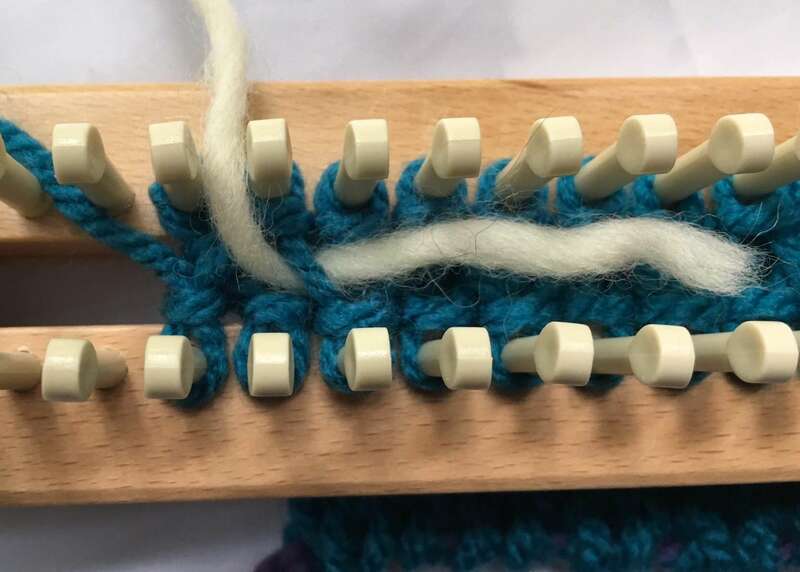 The Double Knit Loom includes very detailed instructions with lots of how-to photos, introducing the double knit ‘in the round’ process. Get started with these easy fun projects. More patterns/projects coming soon! Click on photo for pattern. 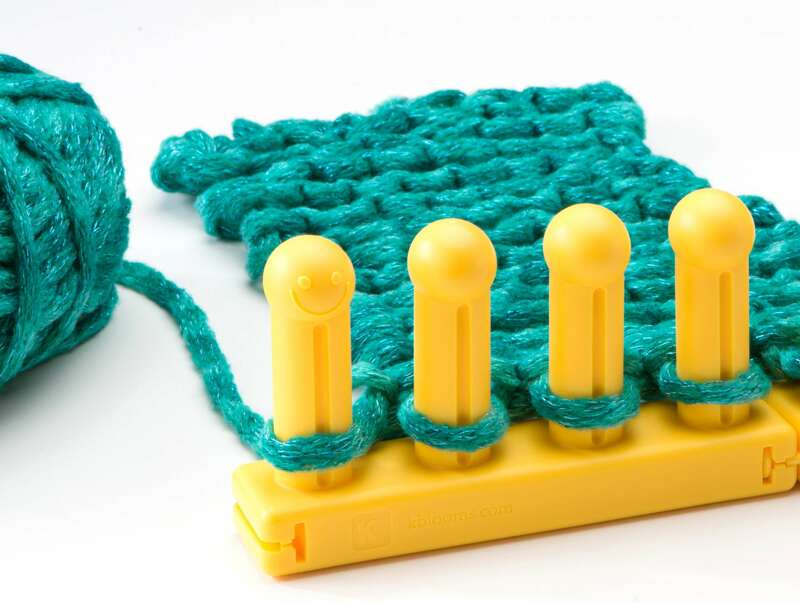 For faster knitting also check out the Loom Double Hooks, knits two pegs at the same time. That just depends on the retail chain….how many of their stores that they schedule for the product and the timing of the purchase. I would just check with your local stores in September and maybe they can answer this for you. I love it i’m from Portugal. When is ready to sale? We can ship now when your order is received. I have the new round and sock looms. 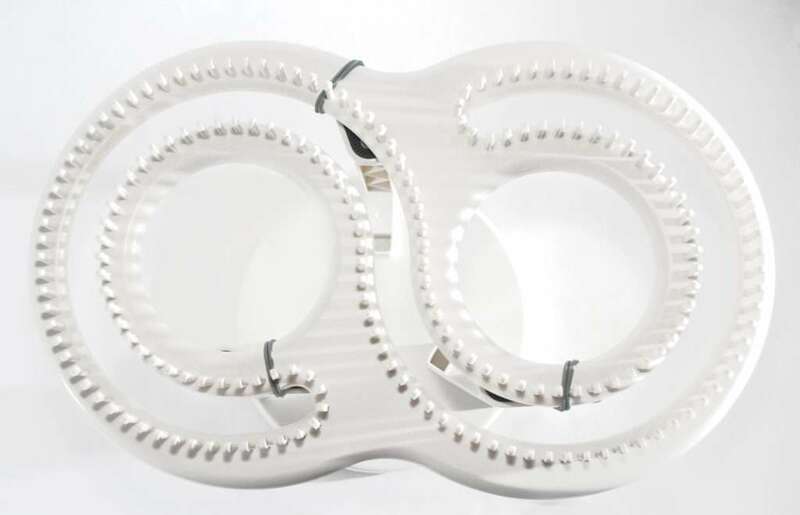 Just I ordered the rotating loom and the double hooks and I can’t wait to get them. I’m so anxious! I love all the looms, I have and used all of them to date. I can hardly wait. What’s the widest selection n the hats it can make? would love to buy one of these but where can I find them. This looks interesting. Are there any video tutorials available? 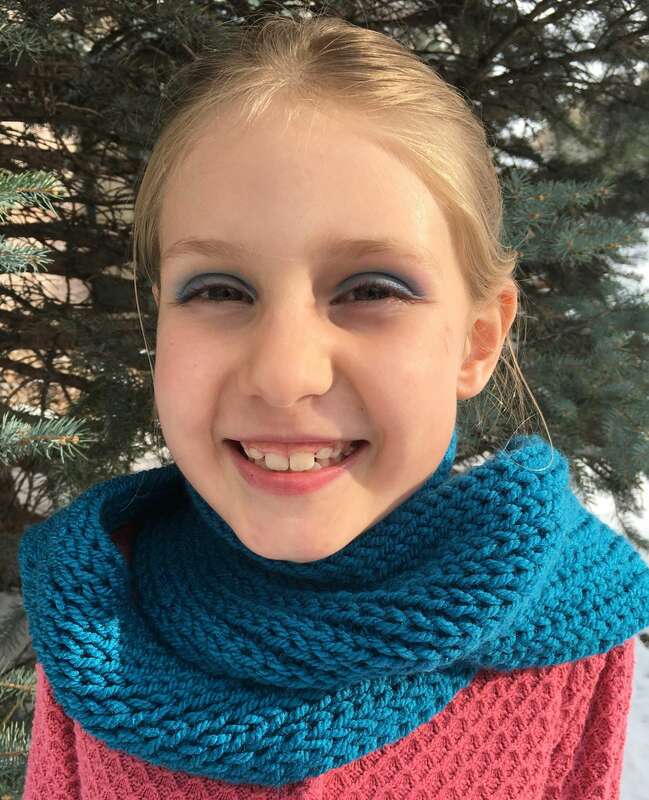 Yes you can knit a double knit scarf up to approximately 16″ wide. We are working on a series of videos, expecting to be up in September. We will announce as date gets closer. Not yet, planning in September. 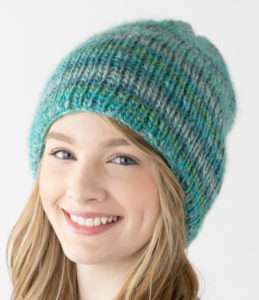 It is awesome for adult double knit hats, and single knit child to youth size depending on stitch. For flat panels in both single and double knit approximately 16″ wide. Thank you for your support of KB!! I’m not seeing a price on this one. I purchased the premium round looms and the his & her sock looms which I saw prices but for some reason, not on this one. Looks very interesting!! The loom sounds wonderful, but I am concerned with the fact that there are only 6 or was it 8 patterns to use with this loom. Will I be able to use any of my hat and scarf patterns on it? Particularly concerned with doing youth hats. I have a 10 year old and a 35 year old that I want to make hats for. You can use all your scarf patterns up to 52 stitches on the loom in single knit or double. The hat knitting is same as working on a round loom. The youth hats are just a matter of what is the head measurement, and how deep do you want to make it. Also, I would experiment with different yarns. You may want to make them in the single knit. 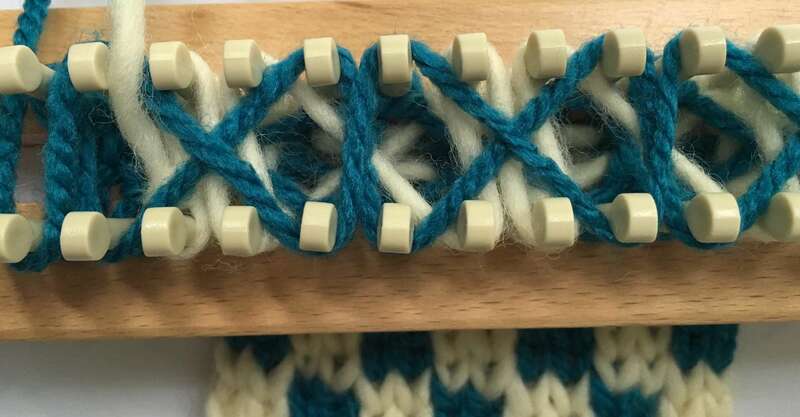 What is the advantage of a double Loom vs. just one Loom? What can you make with the double? 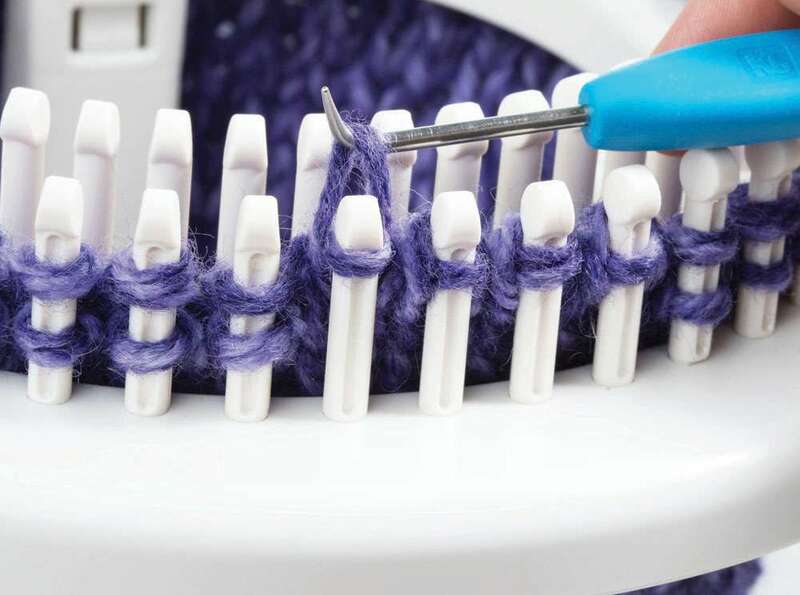 Hi Ann, You use a double set of pegs to work in double knit. Before, all double knit was done in a flat panel and then sewn together. 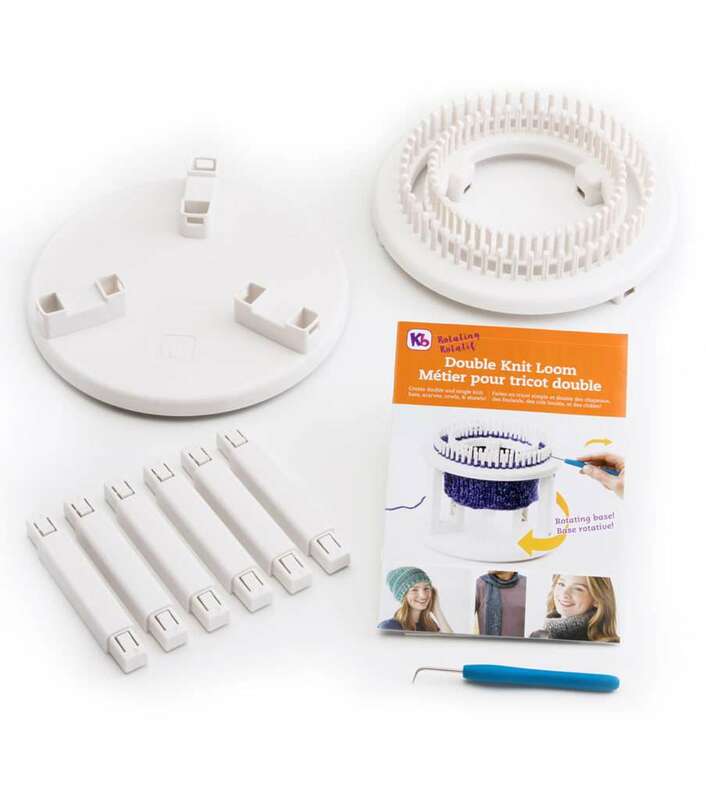 This loom allows you to create a double knit hat in circular and therefore, no seam. 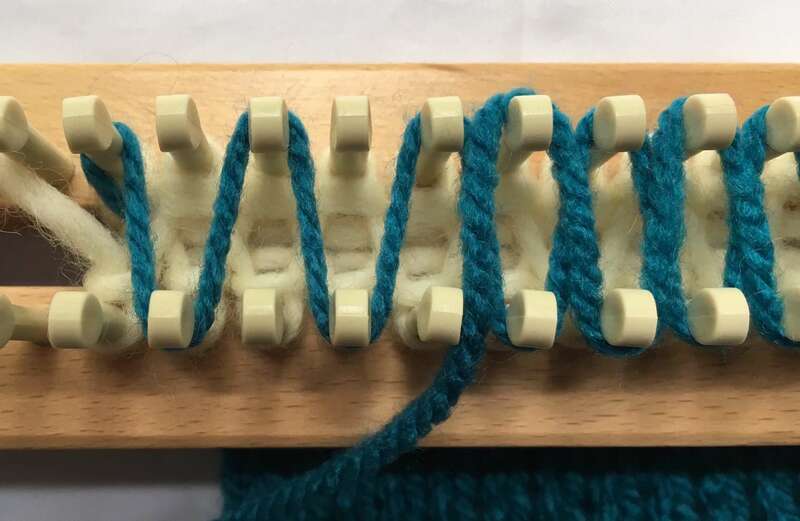 If you are not familiar with double knit, you may enjoy the videos on the website to see what can be done and some advantages of working in double knit as well as single knit. Hi Olga, All available looms can be purchased on website http://www.knittingboard.com. Some hobby and craft stores will be carrying some looms, but you need to check with your local stores for availability. Using the afghan loom and a figure eight stitch, how much yarn is needed to make an lapghan? 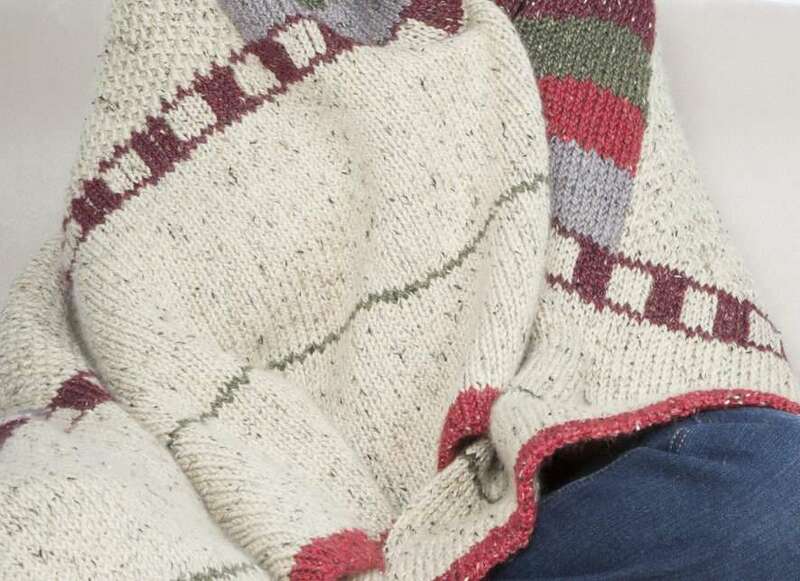 What are the measurements of an average size lapghan? When you do the tutorials will you please make one showing the various ways to work color changes. I have no problem with single knit but, I am having issues with the double knit. 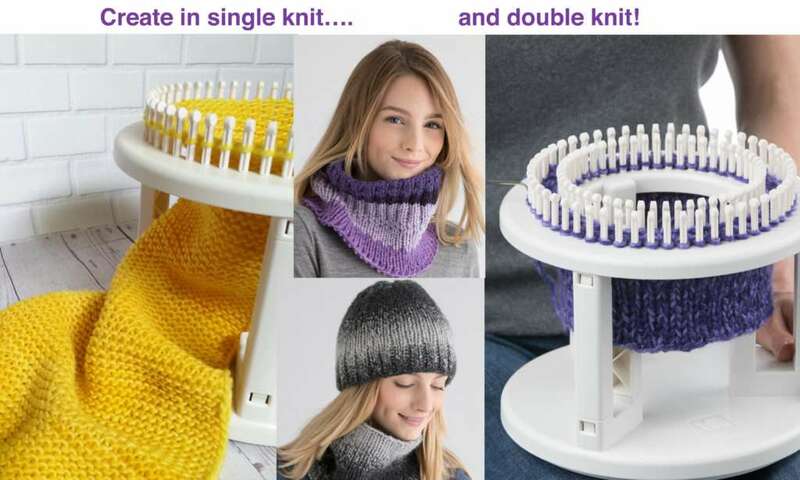 I have the new double knit round loom (which I love ??). I have watched the available videos, they aren’t quite enough. Showing how to carry yarn, start new rounds, attaching new yarn, would greatly help! I am not newbie, and as such, I know that these videos would be of immense value to new loom knitters! Also, would some one make a video showing how to create your own cable patterns. Cables are easy to learn with practice, but a mystery on how to combine different types. Hope that makes sense. Thanks! We will keep this in mind for the next tutorials. Thank you. If the fabric goes down the legs to the base, how do you do any length, without piling it up there? Thanks! Hi Linda, If you are doing a hat, you can just roll it up until the hat is done. If its a flat panel, just allow the length to come out between the legs and there will be no limit as to how long the piece becomes. There are many patterns in our free pattern library that incorporate stripes and fun intarsia designs. Here are a few designs that you may recognize from our afghan patterns. Let’s go over the basics in working with color changes and creating designs. 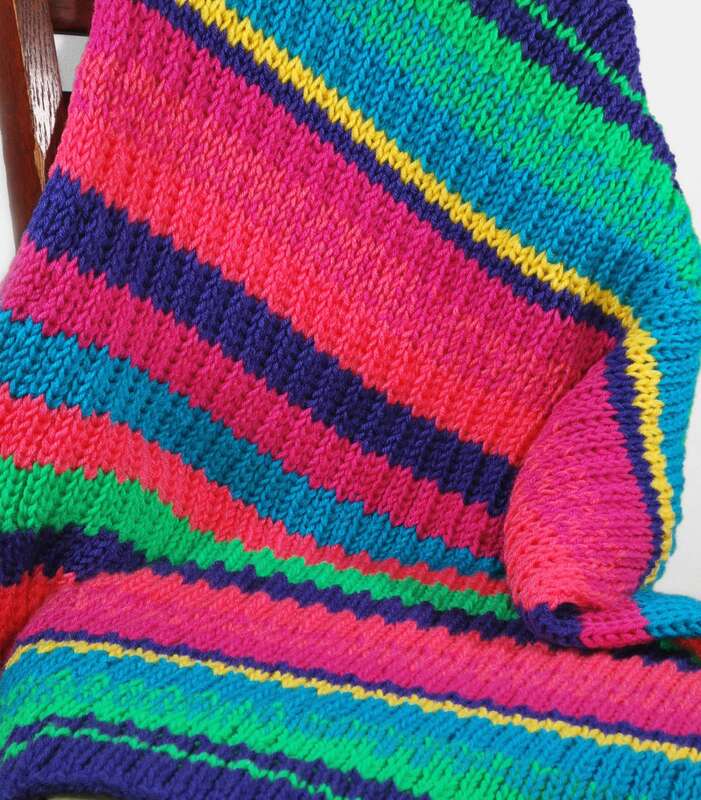 Crayon Box Throw uses basic horizontal stripes. These can be worked in any amount of rows, which will determine how thick the stripe will be. The colors begin at start of a row and go to the end of the row. Horizontal stripes can also be used to create a border at bottom and top of the knitted piece. Vertical stripes are a bit different in that they are created with selected stitches and repeated on the same pins in each row. With each row, the stripe grows longer. They can also be used in just a few rows to create checker board designs. Painted Desert Afghan, uses vertical and horizontal stripes for the 2 color design and the border. We used wide stripes to create the side panels. The 3 panels were sewn together with the invisible stitch. Checkerboard is created with vertical stripes for several rows and groups of stitches in one color, and then, by shifting the rows to different stitches, for several additional rows. They can be created with just 2 colors or many. If you are just exploring this concept, I would suggest starting with just a couple colors. 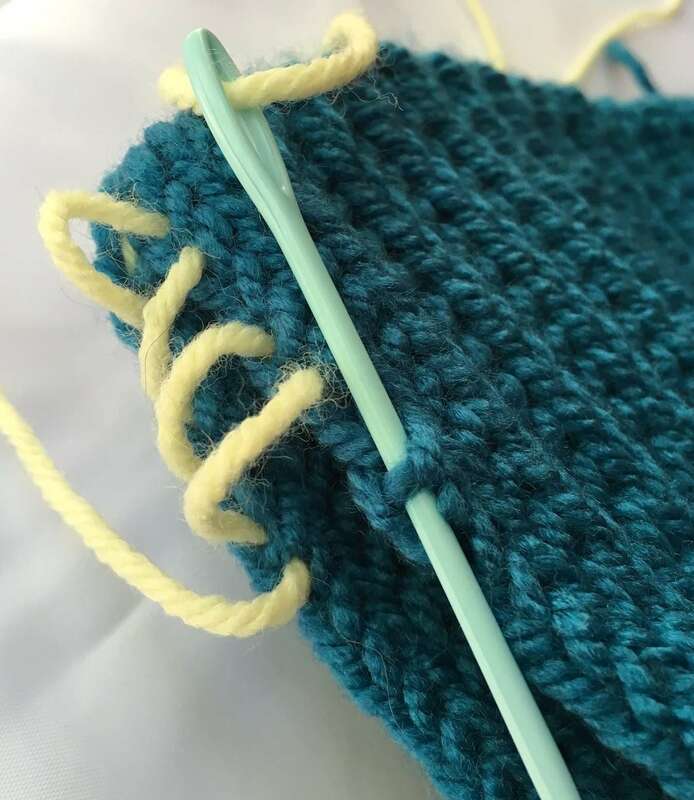 Tangled yarns can be frustrating-but we can talk about ways to assist with this when we start Intarsia . When we designed this large afghan, the New Daisy Afghan , we used a 2 color design by adding colors into the knit creating intarsia flowers. The 2 color side panels were knit separately and all three strips were sewn together using invisible stitch. 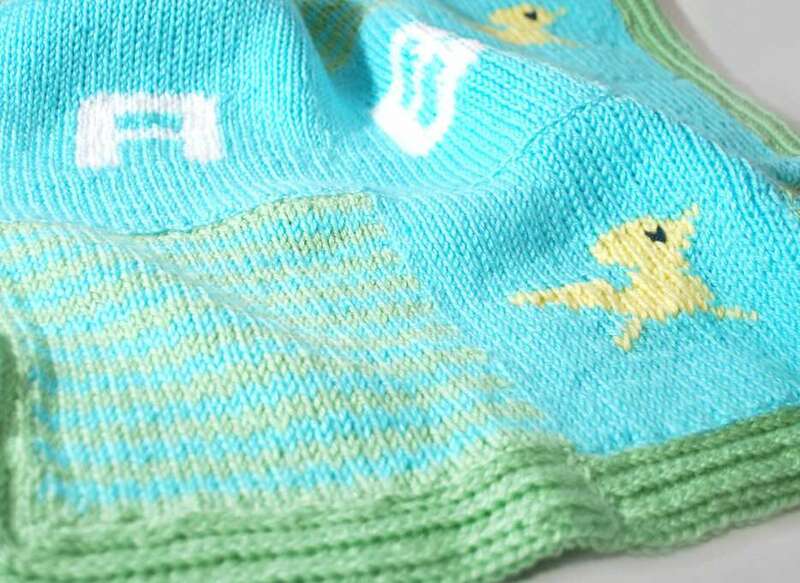 In our Little Chickie Blanket, you can see how colors are used within the knit to create the ‘Chickie’. Also vertical and horizontal stripes are used for the letters and the 2-tone stripe section. This little blanket was knit is 3 strips, but the change of colors makes it look like squares. The border was added as a separate piece and sewn on using invisible stitch. This sewing stitch is illustrated in Part III tutorial. 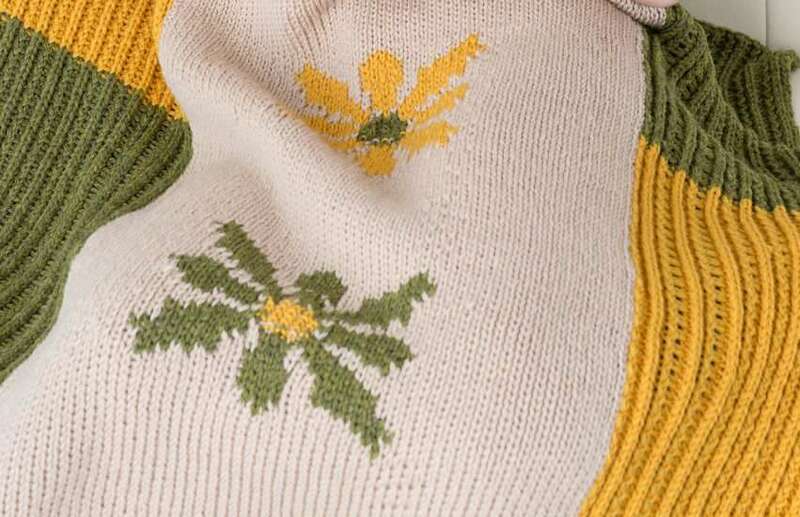 So what does ‘Intarsia’ really mean? According to wikipedia, it means a knitting technique used to create patterns with multiple colors. In single knit, the main color is traditionally dropped behind the peg of a different color as in a slip stitch. So at end of color design, the backside is a maze of yarn colors. In double knit, its a bit different as the color changes are made between the 2 rows of stitches, so they are most often not seen; but, the really great thing about double knit, is that the color design is seen on both sides. This is why double knit intarsia afghans and scarves are so beautiful. Basic Horizontal Stripe: We are working with blue and want to create a white stripe. Pull the white thru the 3rd stitch in center of loom, just under the last row. Keep the blue yarn attached as we will only make the white stripe about 3 rows wide. Then we will continue with the blue again. 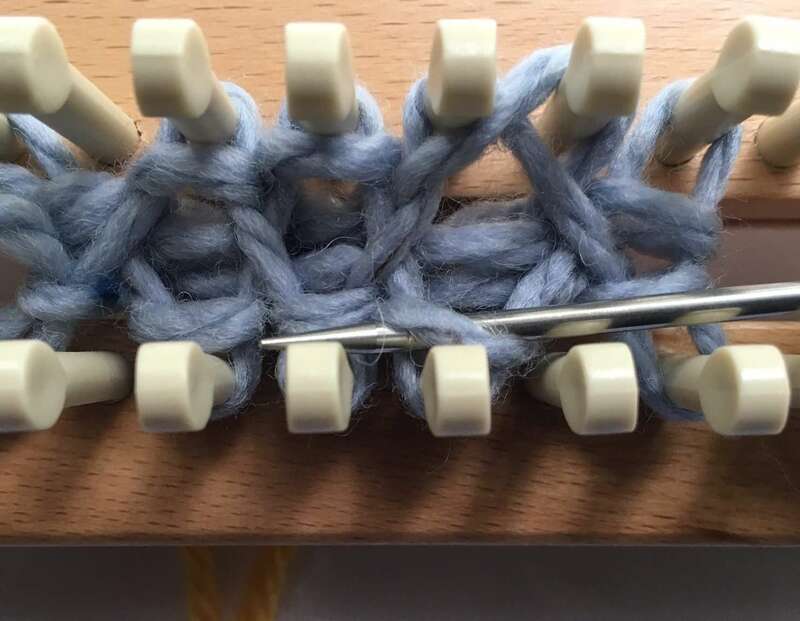 You will see in the photos that the blue yarn is moved slightly with each row, so it doesn’t get caught up in the white row. Work 3 rows with white yarn. Once complete, lay white aside and work rows with the blue. By keeping both yarns attached, we will be ready when we want to start some vertical stripes. If you plan to do more than 3 or 4 rows of a color stripe, it may be best to cut the blue, tie white to blue at 3rd stitch, and then work with new color. Then lay both yarn tails down and continue. 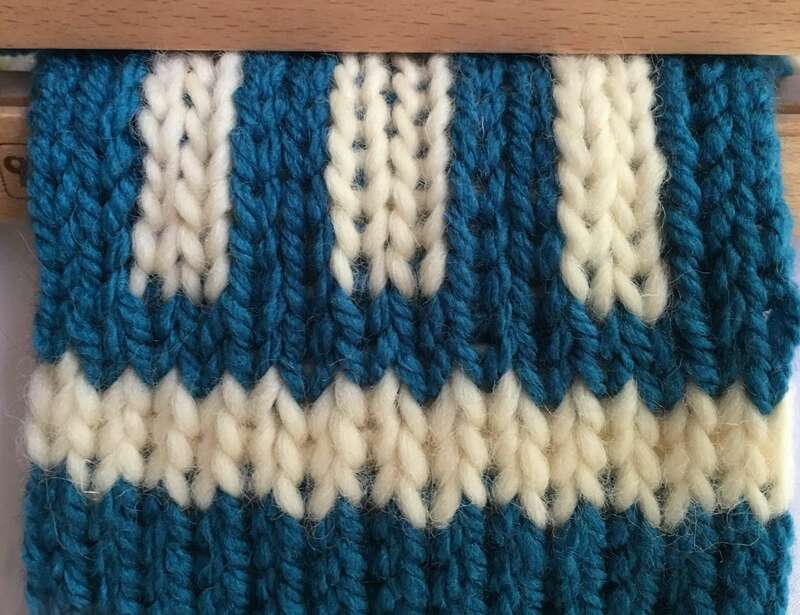 Once you weave and hook over the desired number of rows with the white stripe, lay the white aside and continue with the blue yarn. Continue with the blue knit for as many rows as desired, and maybe change back to the white for another stripe, or maybe tie in another new color. For now, let’s work 2 rows of the blue. Keep both colors attached, because from here, we will be able to go right into some vertical stripes. 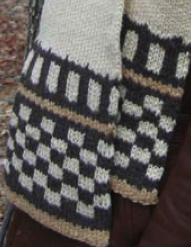 Here is an example of a scarf with horizontal, vertical, and checkerboard. 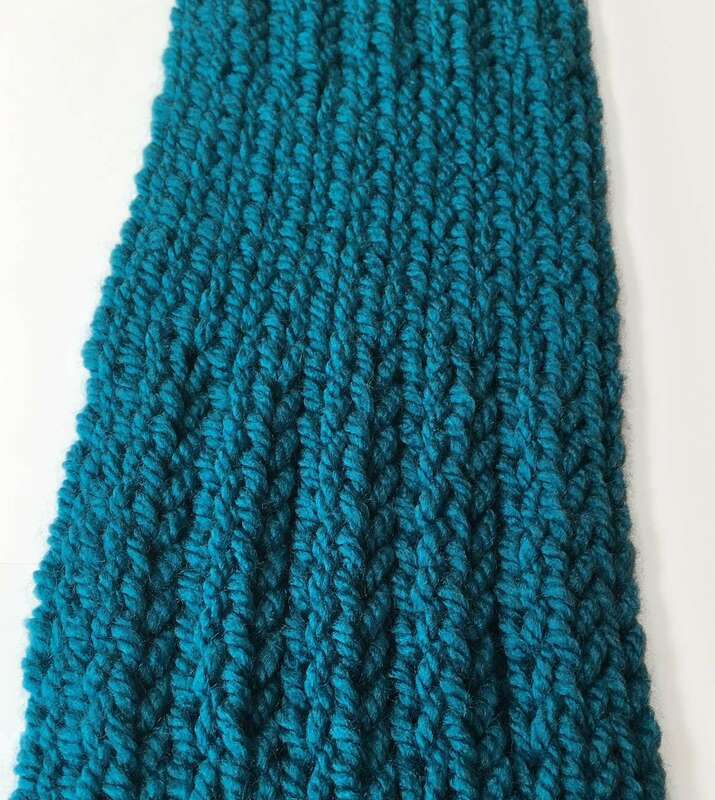 In this scarf, it is the same process as with the blue and white yarns. 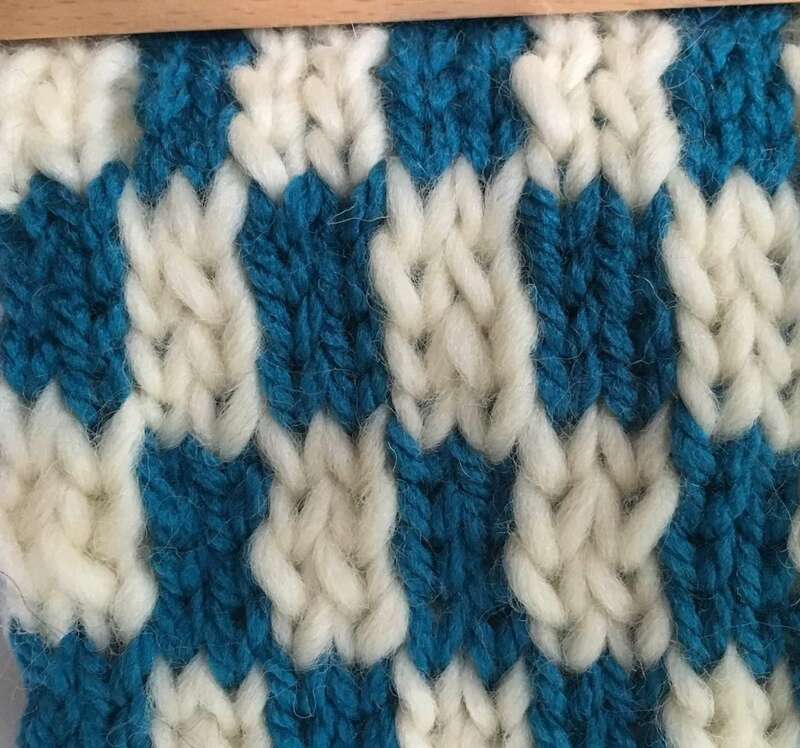 We have blue knit with a 3 row white stripe, and then 2 rows of blue. Now, let’s create vertical stripes to match the vertical stripes in the Checkerboard Scarf. Vertical Stripes: Start vertical stripes by weaving the blue around 2 stitches, skip 2 stitches, blue for 2 stitches, skip 2 stitches, and continue to the end of the piece. See below example of full circular. The row is worked in stockinette stitch, skipping the pegs where the white yarn will be worked in. The white yarn will fill in the stitches that were skipped. Now add the white yarn in stockinette stitch. You can see the previous row is already done. By repeating this row with both colors, you will have vertical stripes growing with the knit. Now, you may be wondering if we could do these vertical stripes with the white yarn in b/b stitch (back to back weaving). When you are working only 2 stitches of a color, that is a good option also. Or you may work the blue in b/b, and then weave the white in stockinette. I think you are beginning to see how this can be expanded into multiple color designs. To create a checkerboard design, work the vertical stripe like above for 3 or 4 rows, the white loops over white, and blue over blue. Then alternate colors. Now do 3 or 4 rows of blue where the white stitches were, and the white where the blue ones were. See photo. This will shift the vertical stripes into checkerboard like on the brown scarf above. But lets look at how the weave will be different if we use some b/b stitches for clarity. As you can see, the white stitches in back/back stitch look pretty much the same as stockinette only a little looser. The best time to use the b/b weaving is within a piece of knit creating a small design. Weave the white over b/b, 2 stitches, move across to next white stitches until all white stitches are covered. Weave over the white stitches in stockinette in blue for a full circular so that all pegs are covered. Hook over. Repeat. Remember in doing any design, be sure to cast on amount of stitches to complete the sequence. Here, we just want even amount of stitches, so the 2-stitch vertical stripe or checkerboard design comes out even. When doing a knitted piece with a small design in it, you will tie on the color of design, close to where the stitches begin. Work the color stitches in that row in b/b stitch. Lay yarn down, and pick up main color and work in stockinette stitch. Work each row, one at a time, using the color sts when required keeping the yarn attached until the design is complete. Tie to working yarn and cut. Weave in the color yarn tail. We will dive into intarsia with graphs and multiple colors in another tutorial. Next month, we will shift focus and see a few new double knit stitches that everyone of all skill levels can enjoy. Thank you for the great tutorial on double knit color change. My daughter and I were trying (with limited success) to change colors. I saw your Advent creations and they looked beautiful but I was afraid to try them. Now I have worked up to the second color change of the checkerboard and it looks great. I’ll be trying some of the Advent projects this fall! Thank you for teaching us. I had just two questions: in double knitting when one changes color is there a need to “twist” the yarns ? Secondly, what is back to back weaving? Thank you for the great instructions. Hi Cindy, So happy that you and your daughter are enjoying colors in your knitting. The back to back or b/b weave is shown and explained in Part 1 and the link is at bottom of this tutorial. But this is also shown in this tutorial where the weaving is front to back rather than the stockinette. Thank you for asking about twisting the yarns, as it is important in color change. If you are working in stockinette where one color is across the weave of the other, you do not need to twist the yarns at the junction of 2 colors meeting. This is because the stockinette will lock the knit together. If, however, you are working in color blocks with 2 different yarns that are not woven over each other, you will want to twist them where they meet. 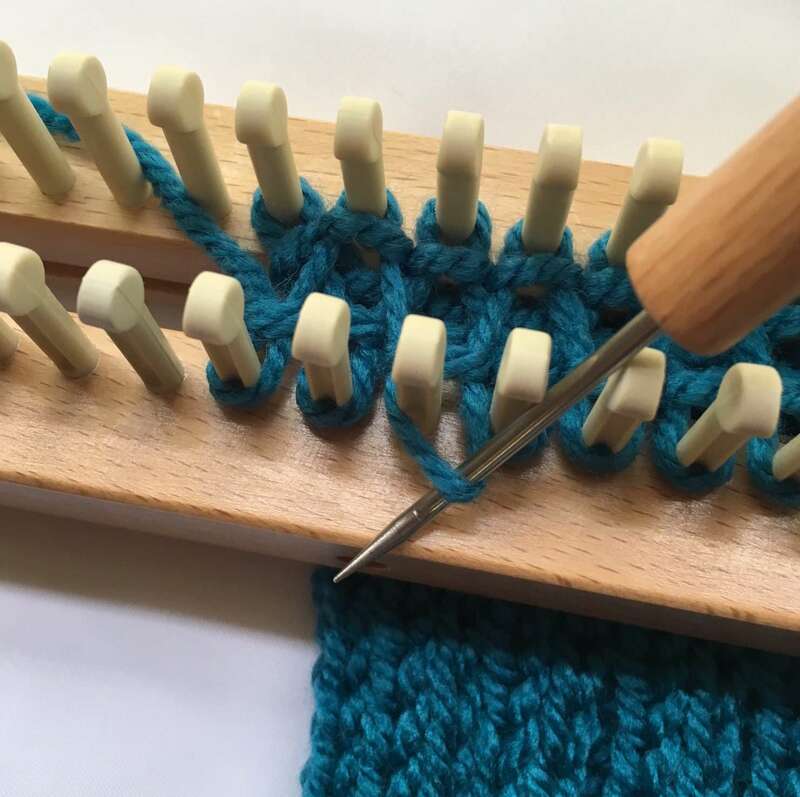 Otherwise, the sections will not be connected in finished knit and will need some ‘sewing’ to connect them. You may find that if you are adding a small amount of a color in your design, it makes twisting easier to cut a small amount of yarn for that section rather than working with 2 large skeins of yarn. Yay, you completed your double knit scarf last month! 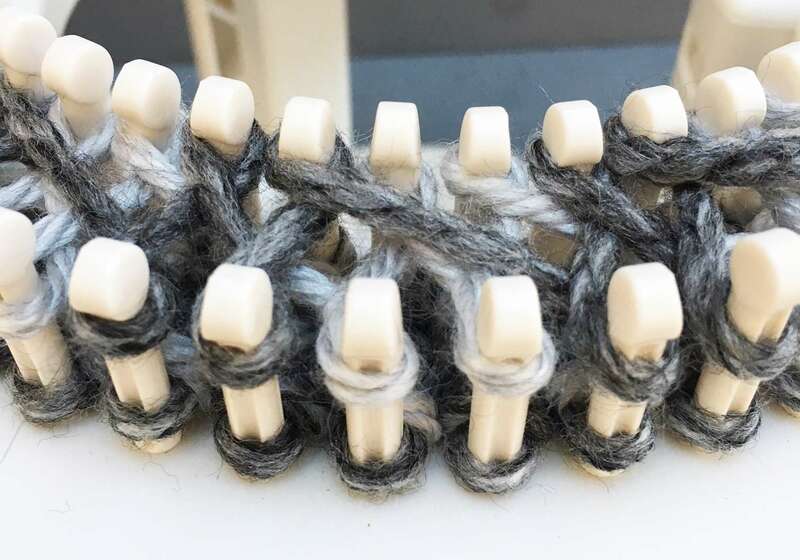 That’s really so cool, because you did the basic cast on with anchor yarn, changed stitch patterns with the Stockinette stitch and the Rib stitch. Hopefully, you finished off both ends and have it ready to wear, when needed. Well, some folks still need their warm wearables handy with the snow still flying in parts of the country. So today, I want to share with you the basics of increasing and decreasing, so you can make lots more fun items in double knit. What can we make, and when will you use the inc and dec? Let’s look at some different situations, and what will the pattern say? The best way to explain the shaping is to just make something with these techniques, for example, a hat to match your scarf. With a double knit hat, we usually make it on a long loom so that we can get the entire length going around the head, all in one piece. This way the cast on, with the anchor yarn edge, will be at the top of hat, and then, just gather the top with the anchor yarn. But sometimes that method creates a hat that is very bunched up at the top, or sits on your head like a paper sack pulled down. 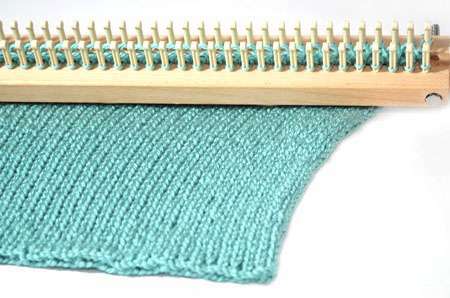 I am using the 18-All-n-One-Loom as the 10″ Knitting Board would be limited, for this example. The All-n-One Loom has 48 pegs, and my hat will need 56 stitches. So, we can just make this in 2 pieces, each will have 28 sts. OH no, you say, sewing? Maybe I did it on purpose, because I wanted to show you how the invisible stitch can be just that…invisible. So with our hat, we are going to make it in 2 shaped pieces and sew them together with invisible stitch. Each piece will look something like this. Here is the hat front or back, they will be the same. We will start the piece at brim and work with rib stitch and stockinette. We will do dec across the center and, on up to hat top. We will use the dec at beginning and end of each row as well as randomly across the entire row. #5 yarn and the All-n-One Loom, set at smallest spacing is used in sample. This will produce a size small hat to fit head circumference of approximately 21-22″. You can make a larger hat by using the mid spacing of the All-n-One Loom. If you are using the 28″Loom, maintain the smaller setting. 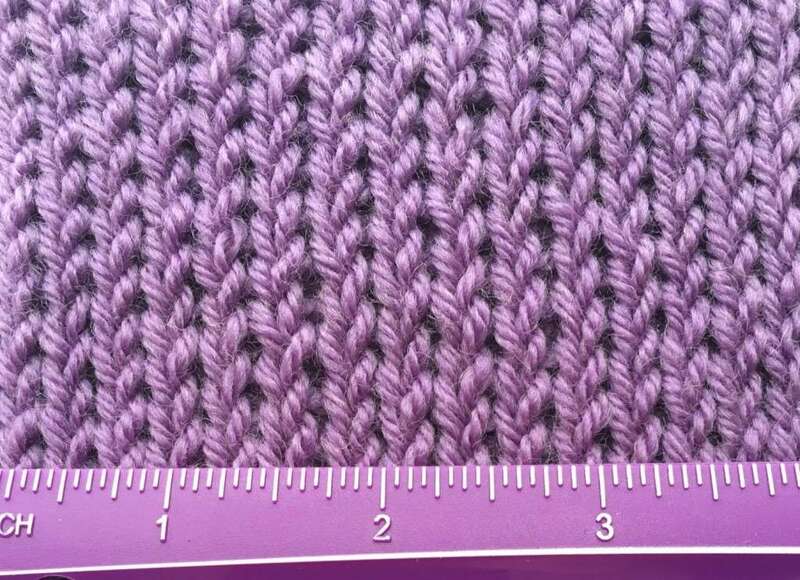 For a deeper hat, work 12 rows of rib st and 12 rows of stockinette st. Our sample measures aprox 9″ deep. Cast On 28 stitches in stockinette stitch. Work in Rib stitch for 10 rows. Change to Stockinette stitch and work for 10 rows. 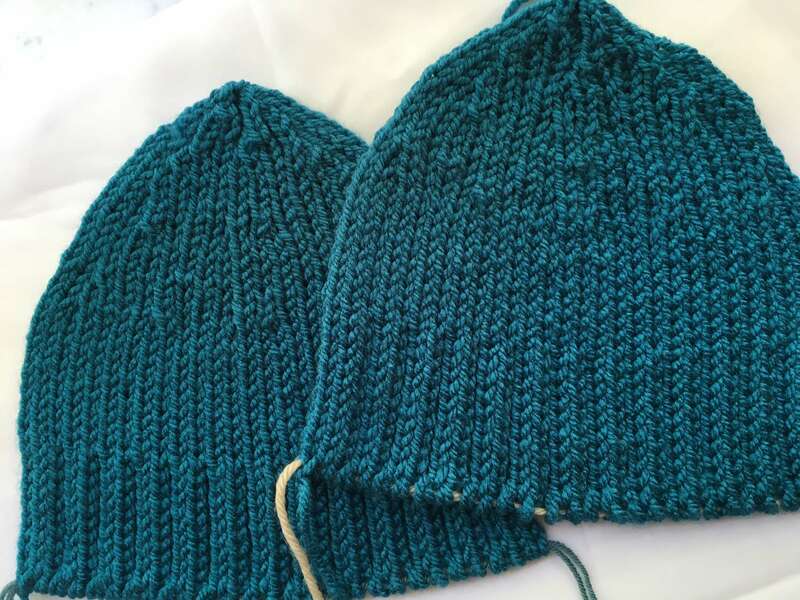 For a deeper hat, change to 12 rows of each stitch. This will add 1″ in depth. We will go thru the series of a dec row before completing our hat panel. 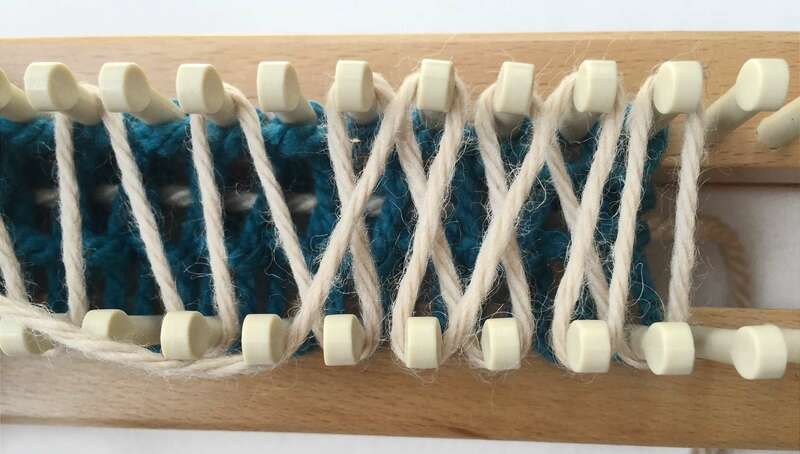 Decrease at ends of loom and across the loom: A basic dec is same as term (k2tog) or knit 2 sts together as one. This is what we are doing. When you combine 2 sts, you are creating an empty peg and the peg next to it has 2 loops. 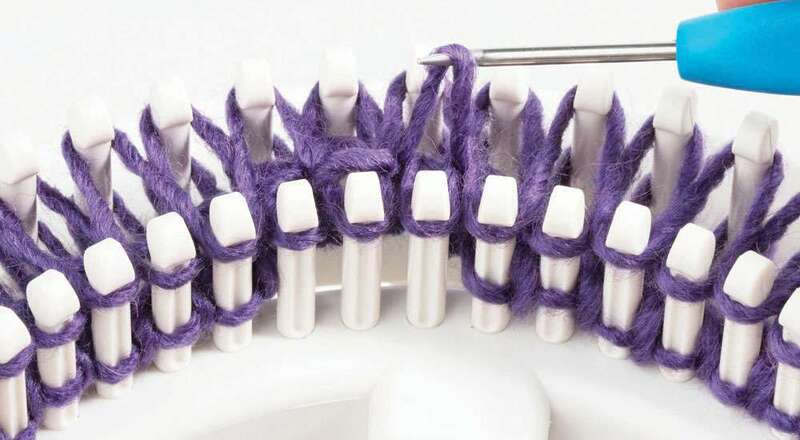 If you leave the pegs empty and continue weaving over them, you will create an open hole as with an eyelet design. 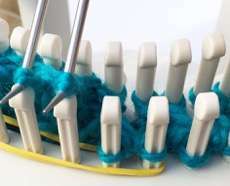 On the other hand, if you move the sts together and eliminate the empty peg, you are reducing the amount of stitches, and making the knit width narrower. This is what we want to do to shape the hat around the head. Sometimes, you want to just bring in the ends with a dec at each end, or some shapes, like a neckline will ask you to dec at just the front end, or back end of loom. When you want a more sharp curve like our hat, we will use some dec rows that will have multiple decreases all across the knitting. 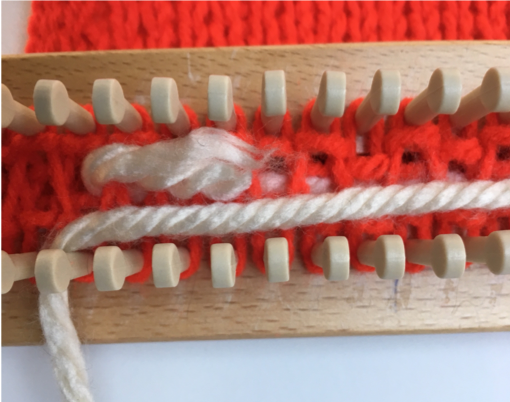 It all does the same thing-make the knit smaller in width.Remember, the dec stitches must be done to both boards for a basic process. We have created empty pegs on both boards by moving loop on peg 2 to peg 3. It is always best to do a dec or inc from inside the knit rather than at the first stitch. There will be times when you will work from peg one, but that is usually for ruffles and intricate little items. 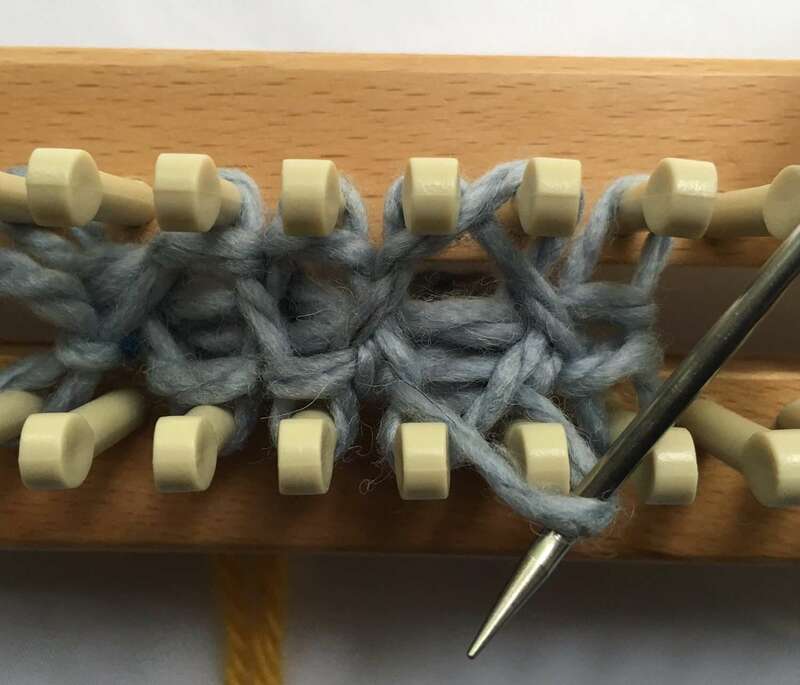 Once you have all the open pegs you need to reduce the size of the knit, start at center of loom and move the pegs over towards center. If you are working with an empty peg that has the 2 loops, be sure to move both of them to next peg. Sometime there will be more than one peg to jump over, and it will be a tight stretch. Just go slow and careful, so that the loops are on the intended pegs. In the photo above, you can see 6 empty pegs on each board. They are ready to be moved over. They all need to be adjacent to each other in order to weave the next (shorter) row. After this row is complete, you will have just 22 sts instead of the 28 sts that you cast on. Be sure to weave over all pegs to complete the row. It can be a bit of a stretch as you move the loops over to close in the empty pegs. Once they are all moved, weave over the pegs and hook over, being careful to lift both loops when working the double loops. Remember, if you leave the loops spaced out, and weave over them, without moving them together, you will create eyelets. Continue the shaping of the hat: We are working from L side of loom. Decrease row #1-Lift loop #3 and place it on peg #4, both boards. Place loop #8 onto peg #9, both boards. Place loop #13 onto peg #14, both boards. Notice they are all laying towards center. Now, place loop #16 onto peg #15, both boards, and loop #21 onto peg #20, and then loop #26 onto peg #25, both boards. Your dec is done. Now, carefully move the loops over until they are all adjacent to each other and you now have 22 sts. Check carefully to be sure you do not have empty pegs. Sometimes, when moving the double loops on one peg, it helps to move one at a time, so you don’t accidentally lose one of them. Weave over the 22 sts and hook over. Work 2 regular rows in stockinette. Dec #2-Lift loop #3 onto peg #4 on both boards. Do this to both ends of loom. You are dec by 2 sts. Work 4 regular rows in stockinette. Dec #3- Lift loop #4 onto peg #5 and loop # 9 onto peg #10. Do this to both boards. Lift loop #17 onto peg #16, and loop #12 onto #11. Do this to both boards. We are decreasing by 4 stitches. Now there are 16 sts on loom. Repeat dec row #2. Work 1 regular row. Repeat dec row #2 again. Work 1 reg row. Dec #4-decrease by 3 sts. Lift loop #3 onto peg #4, both boards, both ends, and one dec in center of knitting. There are 9 sts remaining. Work 1 reg row. Repeat dec row #4-so that you now have 6 sts remaining. Work 1 reg row. Dec 1 st at each end of loom on both boards. Work 1 reg row. Dec 1 st at each end of loom on both boards, and bind off the last sts. THIS PIECE IS DONE. Now, make a 2nd piece exactly the same-it will go so much faster than the first. You now need to sew them together using the invisible stitch. If you look at the outer edges of the hat pieces, you will see where you want to do the sewing-right on the outer edge, so that you can just pull the pieces together. I like to pin the pieces in place before beginning. You can do this with some nice smooth double pointed knitting needles, or, find some very smooth toothpicks. Do the sewing with matching yarn, aprox 3′ long. Use a darning needle to make the stitches. The yarn used in the sample is a contrast color yarn. This was done on purpose, so you can see the stitches, and then see how it disappears once pulled snug into the knitting. The bind off of each piece can be done before the sewing, and remove the anchor yarn, or you can leave them in until after the sewing. I will use this method, so we can have one continuous bind off all around the hat. 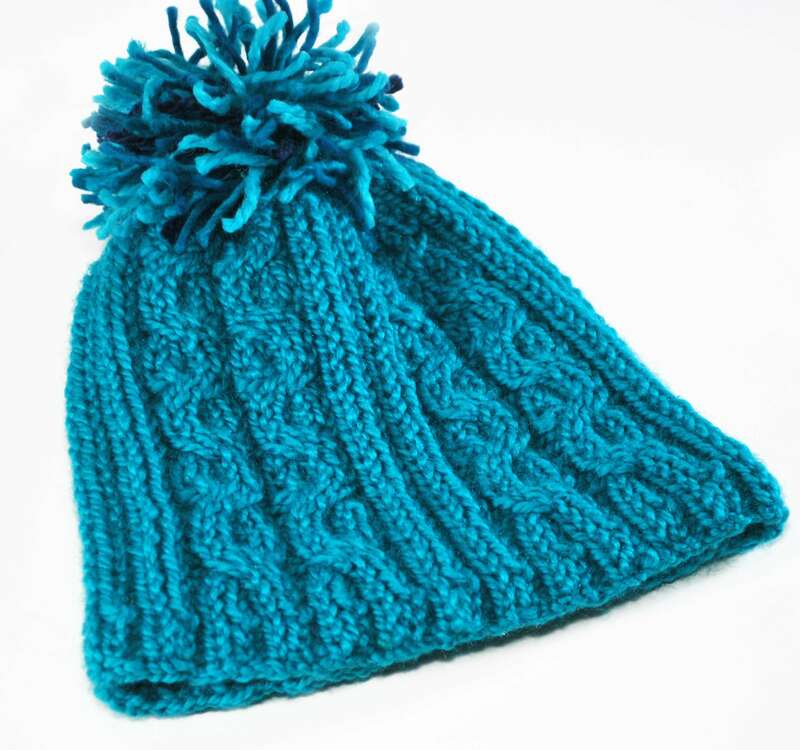 Start sewing at one corner of hat at anchor yarn by simply tying the yarn about 1″ from bottom edge. Bring yarn up thru the knit to the starting point for sewing. This is ready to sew together. With darning needle, start on one edge and grab the cross stitch inside the edge. Without pulling it tight, grab the cross stitch inside other edge. Keep following the seam by alternating from one edge to the other. 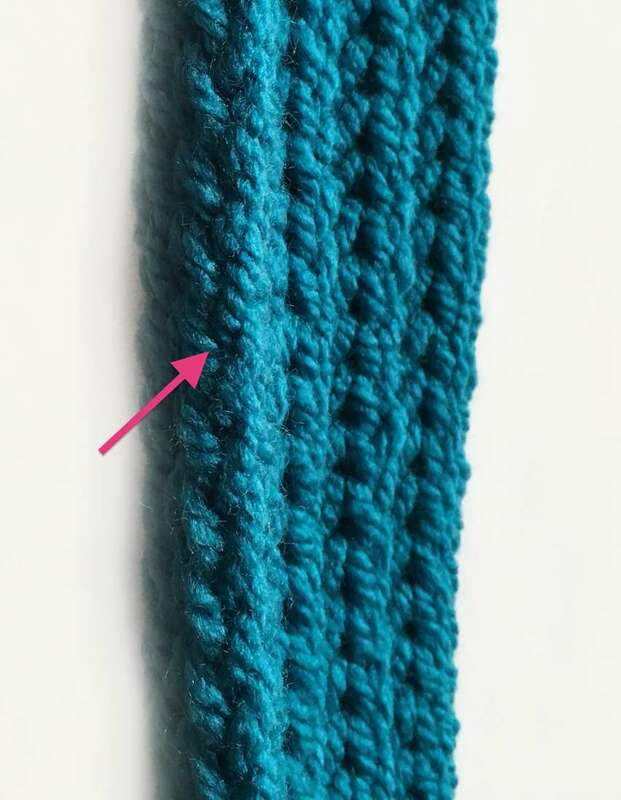 After working for about 2″, you can gently pull the working yarn to bring the 2 edges together. 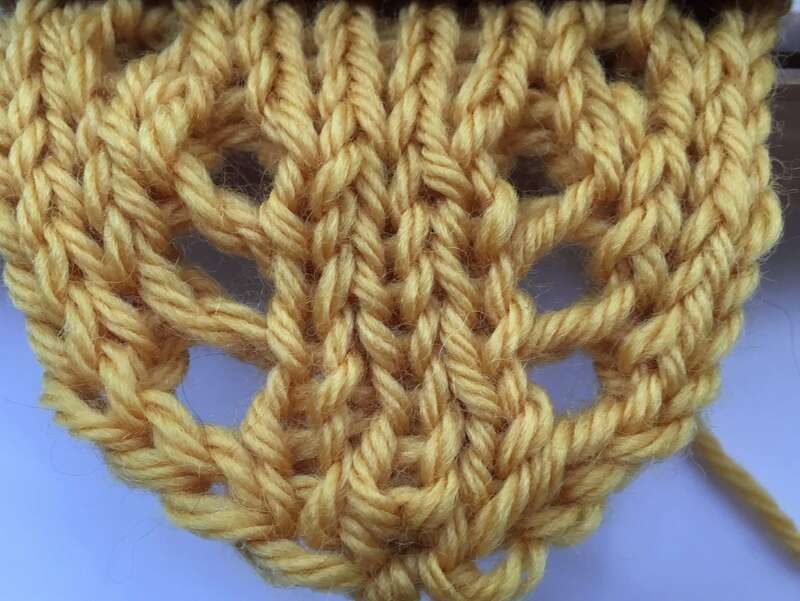 See the pale yellow yarn sewn loosely, and then see how it totally disappears in the next photo.You can gently shape the top of the hat to be rounded or flat across the top, just with the sewing. Once you have sewn the hats pieces together, you are ready to do a nice finish on the hat brim. This will be a simple crochet bind off as shown in Part I of Double Knit 101. 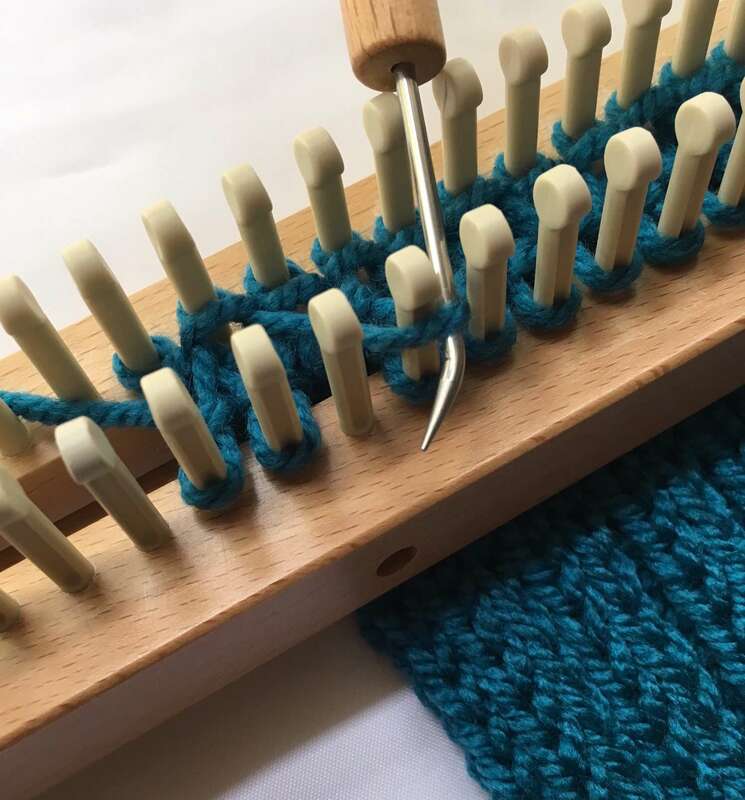 The bind off will connect the 2 pieces with a seamless finished edge. Remove the 2 anchor yarns. Weave in any yarn tails, trim excess and your hat is ready to wear. Add adornments if desired, like a little round flower. Basic Increase preview-Making a circle. Cast On 3 sts stockinette. Place anchor yarn. Inc from st #1 to peg #2, both ends and both boards. Work row. Continue with inc row, now moving stitch #2 to peg #3, and 1 regular row until you have 13 stitches. Inc row, continue till you have 15 sts. Complete in reverse using the dec instead of inc.
Keep working until you are back to 3 sts. Bind off at both anchor, and loom. So how is the basic Inc done in double knit? Pretty much like the Dec except move the 1st stitch out to new empty peg. You have an empty peg between st 1 and st 2. Instead, pick up the loop behind the adjacent peg (this is the last row dropped off) of peg #3. Place that loop onto the empty peg. You now have a new stitch on that empty peg. If you do this to both sides and both ends, your next row will have 2 more stitches. With 5 stitches, now do the inc rows from stitch #2 to peg #3. Cast on 3 sts. Move stitch #1 to new peg creating empty peg. Same on both boards and at both ends. Now you see row with 7 stitches. We are lifting the loop from the previous row to place on the empty peg for the new stitch. Next photo shows the new stitches. Weave this row and hook over. We can go into more detail for the inc process next month, when we will be talking about some color additions, and intarsia designs. We will want to cover buttonholes, for sure. After that some new exciting stitches. Join us here! Another great article. Really like the explanation of he invisible stitch. That is the only stitch I use when sewing together items. Am looking forward to next article when you talk about Intarsia design, a favorite topic and one people like to learn. Thanks for sharing your wealth of knowledge with everyone. I love these tutorials. That circle would be great to make the bottom of a knitted bag. Awesome tutorial! While I didn’t make the hat (yet), I did use it to make the top of a hanging towel and it worked great. Thank you so much! I looked at other tutorials and they just didn’t explain it the way you did, you made it so easy. I agree with you and Claudia, a basket would be fun to make. Check out DOUBLE KNIT Part I for beginning of the series. Double Knit made simple, part II. 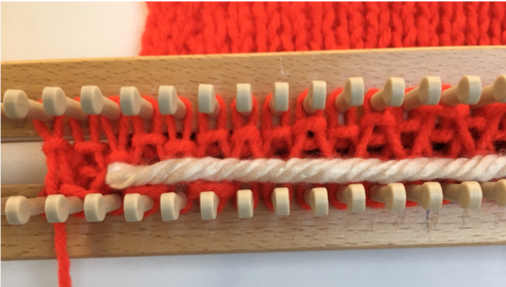 Last month, we began with an overview of what double knit is and, why it works so well. Today…how to get started with the double knit basic cast on, and then cover some basic stitches. We will get into colorwork and cables in a few months. For illustration, we are workng on the 10” Knitting Board and have it set for 2cm spacing between the pegs from rail to rail. This is the mid spacing on the wood blocks. This loom has 24 double pegs, but we are going to use 14 stitches for illustration. Place cast on in the center of loom. I have chosen a pretty yarn in #5 weight, Big Twists Yarn in 100% acrylic. This is a 2 ply yarn and works well in loom knitting. 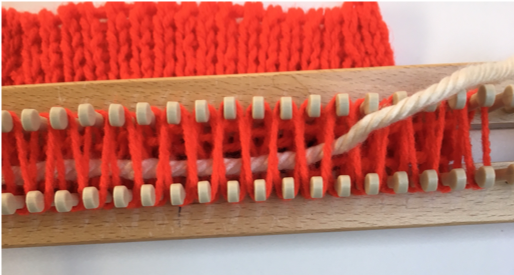 Remember that in double knit, we want to use both sides of the loom, so that our resulting knit is interlocked. Let’s begin…Place slip knot on the first peg on the back board. When we refer to first stitch, it is the first stitch used for the cast on, not always the first on the board. We are doing the basic wrap for cast on. From the first peg on back board, wrap the 2nd peg on front board. Wrap across the loom and skip every other peg. Continue until you have the amount of stitches desired. Wrap around the end pegs, and work back to first peg, covering all skipped pegs. You will end at peg on front board directly across from first peg. You now have a ‘full circular’ on the loom. You are ready to place an anchor yarn. The anchor yarn is not a requirement, but you will see how easily it makes the first row, and controls all the stitches. Most times the anchor yarn will be removed when you get done with the knitting, and you will finish off the cast on stitches with a nice crochet edge. Other times, the anchor yarn stays in and becomes a drawstring to gather the stitches together like in the crown of a hat. 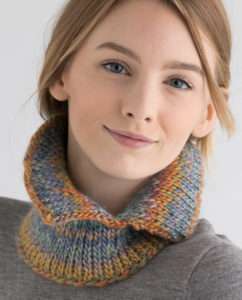 It is also useful to help pull down the first few rows of knitting and keep the tension even. A pattern will tell you when to use a contrast color of yarn for the anchor since it will be removed, or, to use a matching yarn that will remain in the knitting for another use. You will notice that the anchor yarn only covers the stitch area and the ends drop down between the boards. It works best if you make it long enough to tie under the board. This way, it is not accidentally pulled out. At this point, you are ready to add another row of weaving. Work it just like you did the first row. Wrap the first peg and down the the 2nd peg on front board and continue across the stitches wrapping every other peg. Turn around at end, and wrap the pegs going back towards first peg. There will now be 2 loops on each peg, and the anchor yarn is between. Let the anchor yarn assist you when you ‘hook over’ this cast on row. Hooking over is just the term used to describe the action of lifting the bottom loop over the top. See below. 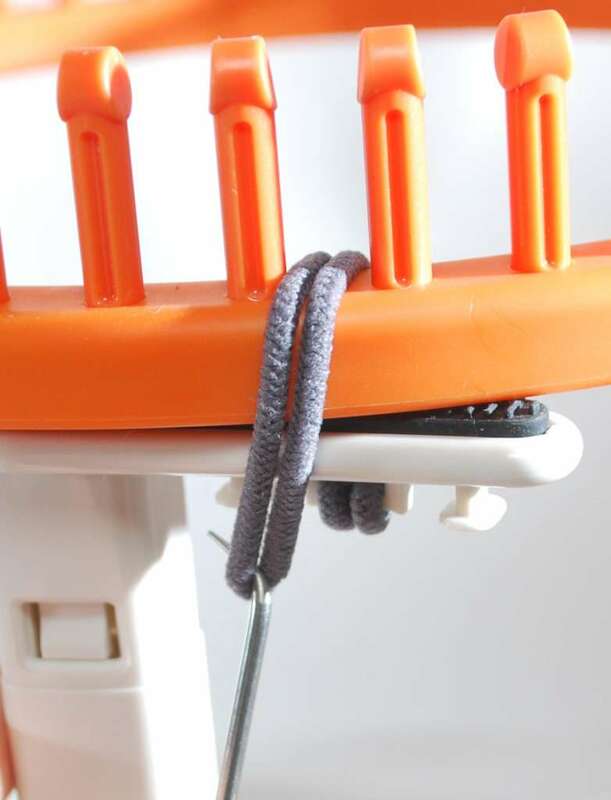 With knit hook, lift bottom loops over top loops and off pegs. Take loop up and over, and drop it off of peg. You will do the ‘hook over’ on all stitches on both boards. Hint: In order to keep the sides of the knit even, do the hook over as in the photos from Left side of knit to about center of the stitches. 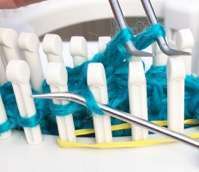 Then go to the Right side of knit and work to the center, so that all pegs are completed. 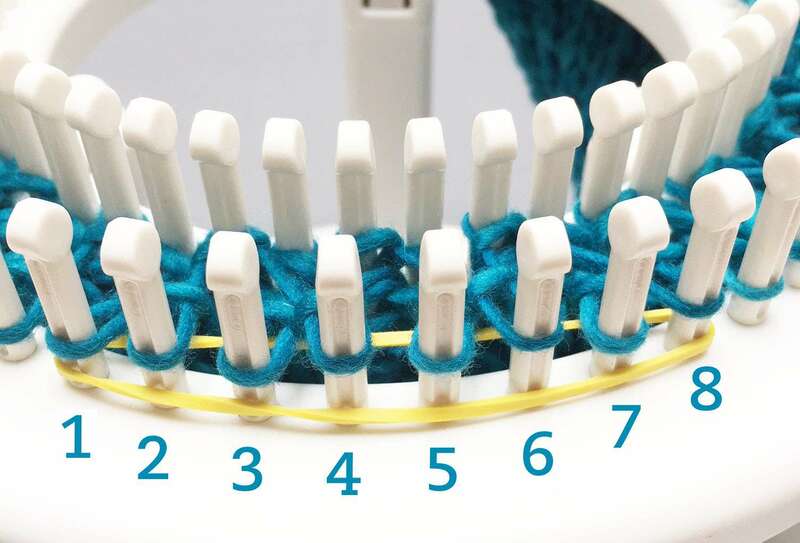 Just vary the center point, so that you do not create a line in the knit. This will keep edges even. Work pegs on other side of loom also. 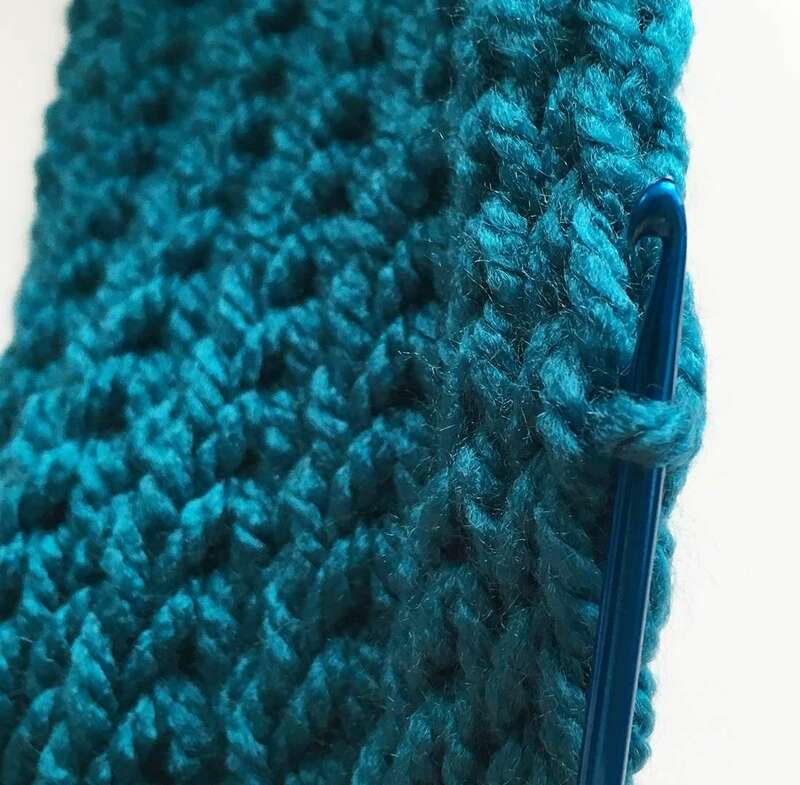 After you do the ‘hook over’ on all stitches, you can just push them down in center between the boards, and pull down gently on the anchor yarn. Your stitches are now Cast On. You are ready to work in Stockinette or Rib stitch, or any other that you will learn. 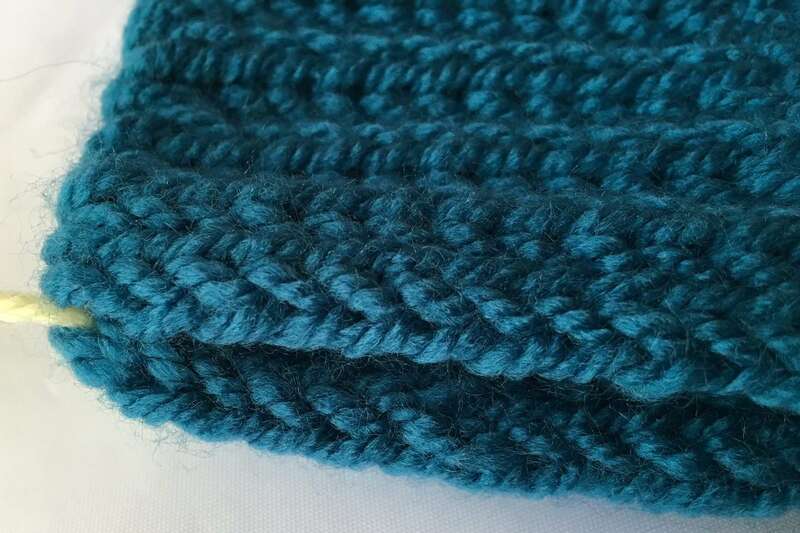 Stockinette stitch: This is the basic stitch and forms a smooth knit on both sides. It is done exactly like the weave of the cast on row. The Rib stitch: To create a rib pattern, the weave is just slightly different. Let’s look at the cream yarn to see the difference. Wrap the back board on first peg and then down to the 3rd peg on front board. You can see the angle is more extreme than with stockinette. You are working from peg 1 to peg 3 by skipping the first 2 pegs on front board. Continue with this angle and wrap every other peg to end of knit. Wrap the yarn around the end pegs and return. The first stitch is consecutive with the end pegs. Then you will be working all empty pegs. As you return to first peg, you will see that you are still working from peg 1 to peg 3, and then, every other. The first 2 pegs will be wrapped consecutively. Just be sure to cover all pegs. You will also notice that you are working at opposite angle with the weaving. This is what creates the ribs. You will find as you work the stitch pattern, your stitches will create pairs of stitches for each rib. 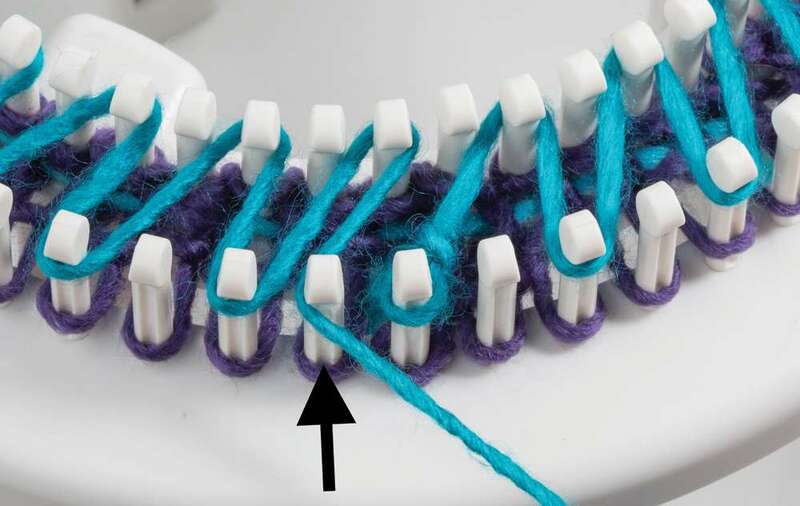 Once you get back to the first stitch, all pegs should have 2 loops. The ‘hook over’ process is the same as the Stockinette stitch. Continue with the Rib weave as long as desired or according to your pattern. 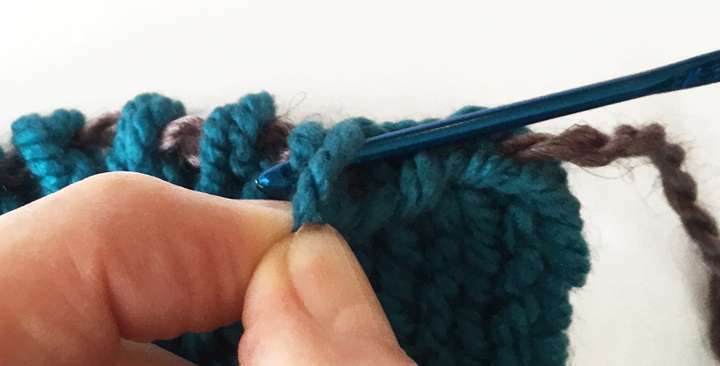 Back to Back Stitch: Sometimes, you want to just add a few stitches for accent or make the entire knitted piece in a simple stitch referred to as the Back to Back stitch. It takes only one pass of the loom for each row. Just weave front to back on the pegs of each stitch. The finished knit will look similar to the Stockinette, but may be a bit looser. We will use it later, in color work. BIND OFF: So enough for our basic stitches, let’s learn how to take the knit off the loom, Bind Off. We need to bind off at the loom, and then, at the anchor yarn of the Cast On stitches. Start on the end of the loom opposite the yarn, or the back end. You can go ahead and cut the yarn leaving a few inches of ‘yarn tail’. The yarn tail is usually about 3-4″ long and will be used to knot the last stitch. Insert the crochet hook into the first stitch on back board. Lift it off the loom. Then, pick up the first stitch on the front board. You have 2 loops on the crochet hook. Pull the loop closest to the hook thru the other loop. Now pick up the next loop on the back board. Pull the loop closest to hook thru the other loop. Pick up the next loop from the front board. Pull one thru one. 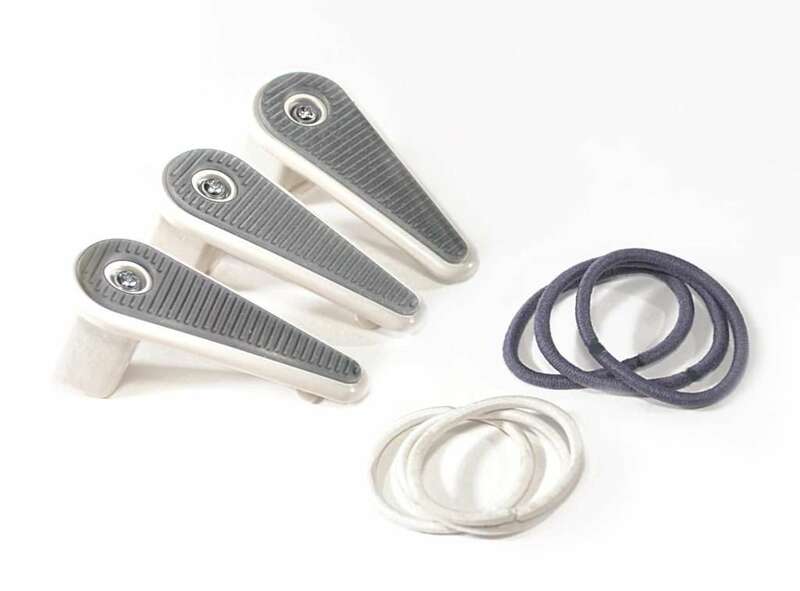 Continue this process, alternating front board and back board until you have the last loop on the hook. Now, you are at that yarn tail, so you can pull it thru the last loop and gently tighten. Now, we are looking at Cast On stitches with the anchor yarn. We want to put a nice even finish on this end also. Start at end opposite the yarn tail. Pick up just the first 2 loops. Pull the loop closest to the hook thru the other loop, just as you did on the loom Bind Off. 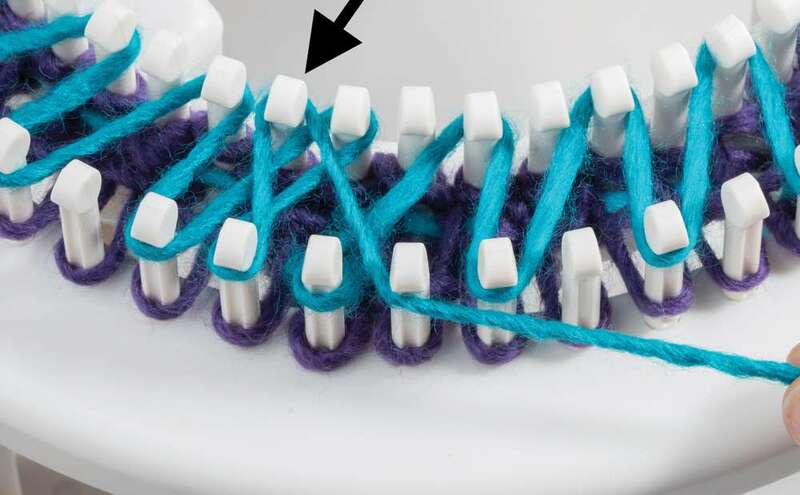 Continue across the knit until you reach the last loop and use the yarn tail to knot the edge. 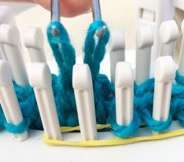 You can just use your fingers to assist with moving one loop on the crochet hook thru the other loop. Once the ends of your scarf are finished with the Crochet Bind Off, just weave the yarn tails into the knit. Take the crochet hook up thru the 2 layers of knit so that the hook comes out close to yarn tail. Draw the yarn into the knit, carefully, so that even the knot is tucked away, out of sight. 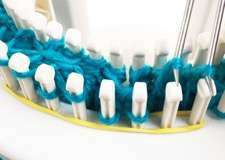 Then just remove the crochet hook by taking it out the end with the hook. This way, you will not snag the knit. With what you have learned about double knit, you can create your first completed item. YAY!! How about using the stitches to do a new scarf. 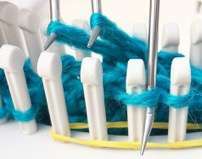 Get loom and yarn, knit hook, and crochet hook in hand. Cast on 14 stitches in Stockinette stitch, add anchor yarn, and continue for about 12 rows. Then with no change of pace, just start the next row in Rib stitch. Work in Rib stitch for 12 rows. Then start next row in Stockinette stitch. On and on you will go, until you look down and have a great scarf. You may decide to work the scarf using 20 or 22 stitches. That’s your choice. Then bind off stitches at both ends. Now, let’s look at how our two stitches look as a stitch pattern. Remember, our stitch pattern was 12 rows of Stockinette stitch, 12 rows of Rib stitch, and repeating all the way down. 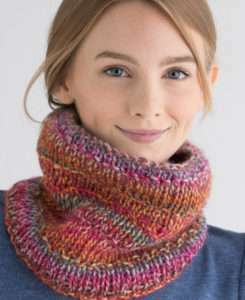 A scarf can be made as long as desired and this one could be really long if you used a full skein (ball) of yarn and knit it with just 14 stitches. Or maybe you decided to make it wider and shorter. That’s the fun of being creative with our double knit. The photo (below) shows the double knit edge of the scarf. It is always easy to count your completed rows by counting the stitches along the outer edge. The next photo (below) shows how to pick up the horizontal cross stitch on the edge of double knit when you want to sew 2 edges together with an invisible stitch. We will cover both of these topics next month along with some increase and decrease techniques to add shape to the knit. HAPPY KNITTING! Both links went to lesson part 2, (even the one that was meant to be for part 1!) but I missed part 1 and could not find out how to find it. Is it possible to send the correct link please? Thanks, I have now found part 1 on the website, even though the link in the email goes to part 2. I wonder if the “Back to Back” stich is the one that has the same effect than knitting flat. Thank you, We have added it to the part II also. Pat, once again, great article on double knit. I hope with all your clear and excellent instructions that folks will get excited about double knit as well as single. Both are exciting and offer so much variety to the knitter on the knitting boards. Thanks again for sharing your wealth of knowledge with us all!! To find all the previous stitches in this column, simply click here. Just wanted to let you know that the link error is now corrected. It occurred when the categories for the site were changed. 😉 Thanks for letting us know, Kim! The hobby of knitting, at one time, was simple. You would pick out a yarn; it was most likely a worsted weight in assorted colors. 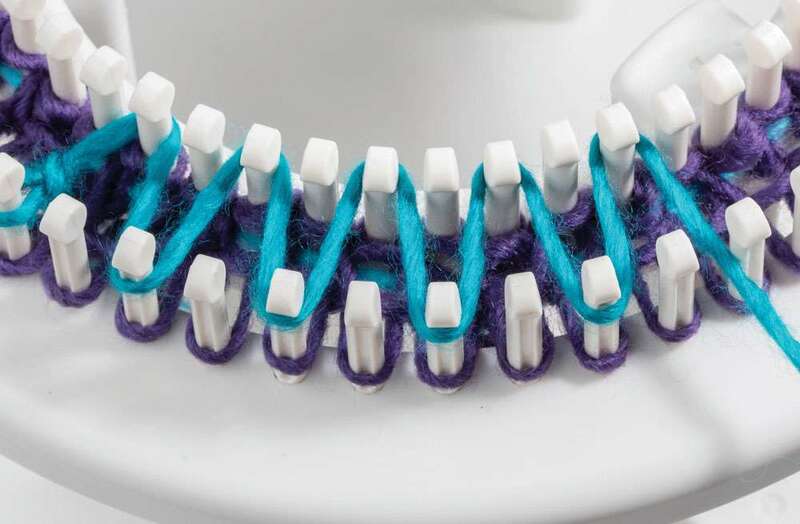 With just 2 needles and some guidelines, you could be making a scarf. Then the yarn selection began to grow and over the years, we saw all the new fibers and combinations that were being offered. It was no longer just a Worsted World. The huge, biggie yarns are really trending now, and a lot of fun. We also have boucle and eyelash, sock and glitter. Just look at all the great color combinations on the store shelves. Then, there’s all the different size needles and the circular needles and accessories like stitch holders, markers, gauge guides, darning needles, gauge counters, double ended, ring markers, blocking wires, row counters, as well as all the different sizes of each one. As we go along and time passes, we keep seeing more new gadgets, and helpful tools. We ask a question and get an earful of knitting terms, complex explanations, and a helpful person saying, “its so easy and quick, anyone can learn to knit.” So you decide to buy a book, and find that there are over 350+ book titles with the same promise, “its so easy to learn this way.” So, you go to the internet and start reading, and joining groups and blogs and picking out patterns that you like, and save them. Then, there’s those terms again and the abbreviations, and the charts, and the gauges, and the various cast ons, bind offs, skip this and skip that, and finally you decide its just too confusing. So after all the time and money spent, you want to come out with something, so you knit a scarf. You don’t like it- so you give it away, and feel good about yourself. You put the ‘stuff’ away, until later, when you may decide to try it again. Has anyone been down this road before? Maybe 10 years ago, or, maybe just recently? I guess it’s like anything else you enjoy-it becomes a hobby for you, and your favorite pastime. It relaxes you, and you continue learning from all the media, knit friends, and personal experience. 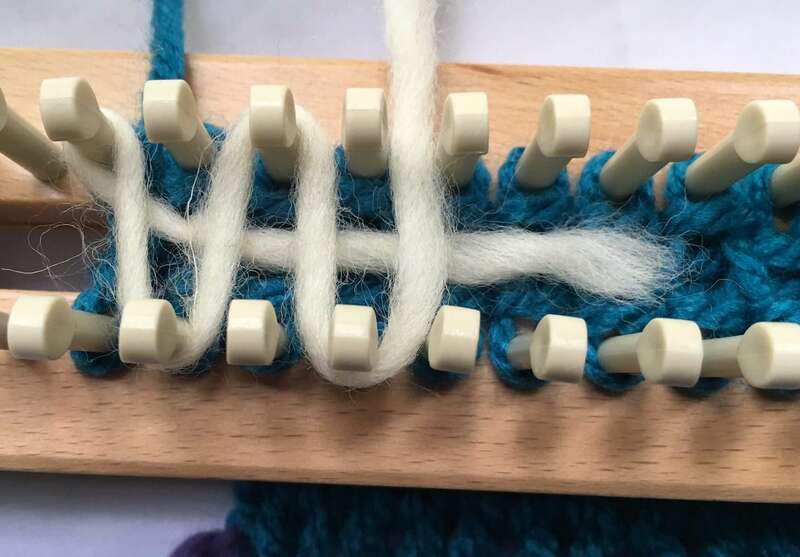 But for those just starting out, we are going to attempt to take some of the confusion out of just one form of knitting– double knitting on a loom! We are going to start from scratch, so that ‘anyone can learn to do double knit’. See, I said it too! So, let’s breakdown all the terms and uncertainty as we go. I’m Pat Novak and have been doing double knit on a loom for 15 years after designing and knitting with 2 needles for 5 years. But, its so amazing how much has emerged; I get confused with all the new and wonderful things and ideas I see coming out of other knitters. There are amazing designers out there. It’s sure a hobby that you never outgrow, or ever run out of new ideas and designs to learn. So, hopefully, once you get the basics, you will enjoy the journey of a continuing loom knitting education, from all sources. We want to offer these articles with the basic info, the ground roots, to get you started out, with lots of success. You hear the term when looking at fabric, or in clothing-it is called double knit jersey. It means that the fabric is woven with 2 layers of thread, which makes it stretchy and durable. It’s the same in knitwear that is double knit; you create a fabric with 2 layers of yarn that is woven together. Remember that-it’s woven together, or interlocked. It can be bulky and thick, or thin and lacey. Being interlocked is different from a knitted circular tube. This is why you do not get a knit side and a purl side to your knitting. The result is the same knit side on both back and front creating a reversible fabric. So, for the afghan or scarf, it can flip around and have the same look on both sides. This is especially beneficial when you add colorwork to the knit. This will come later. 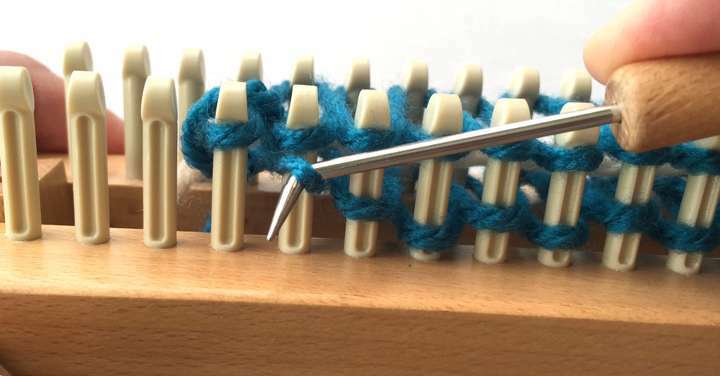 Getting started doing your double knit, will require a loom with 2 rows of needles or pegs across from each other. The pegs are usually placed directly across from the other row. So, you need 2 rails that are connected at the ends. The spacing between the rails, is determined by some type of spacer, holding them in place. The amount of space between the rails determines the size of the stitches created. For example, we are showing the KB 10” knitting board. It has 2 rails, each with 24 pegs that are placed directly across from each other. The little block of wood between them is set at 1cm – 3cm apart. They are held together with long bolts and wing nuts. Each stitch in double knit requires both pegs, one on each rail. So this loom or knitting board has 24 double stitches. By weaving the yarn back and forth across both rails, the resulting knit will be interlocked, or one single double knit fabric. Now, you are probably wondering what the fabric will look like in double knit-will it be too thick if it is double? Good question! This all depends on the yarn chosen and the gauge of the knitting. Yarn can be used from very fine to bulky. We will show you the difference with #3 (DK) yarn (just a little thinner than worsted weight) vs #6 (Bulky/thick) yarn, and also the 2cm spacing. But we also want to look at the comparison with different spacing between the 2 rows of pegs. This measurement between the peg rails will change the size of the stitch. With larger stitches, the knitted width can also change. For illustration, we will use the rail spacing of 1cm apart compared to 3cm apart. Then we’ll be looking at very thin yarn with 2cm spacing. Here is a sample of working with 1cm spacing. This means there is 7/8″ between the pegs from one row to the pegs on other row. The yarn is #3 DK weight and the gauge of knitting is 4 stitches in one inch of knitting. You can see the rows on the ruler. 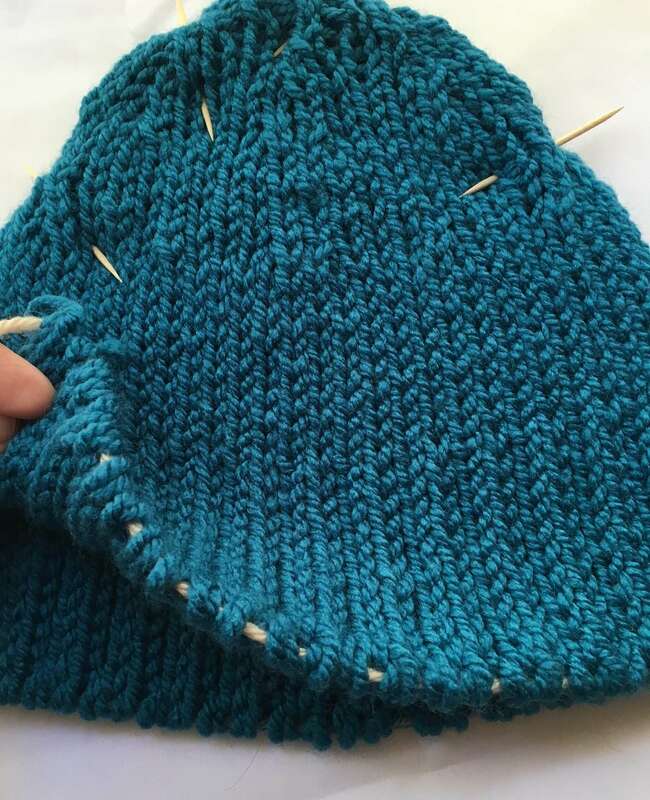 For a piece of knitting 4″ wide, you would cast on 16 stitches. This is a nice tight, smooth knit great for most items. Yarn shown is Paton’s Classic Wool, DK Superwash, all wool. 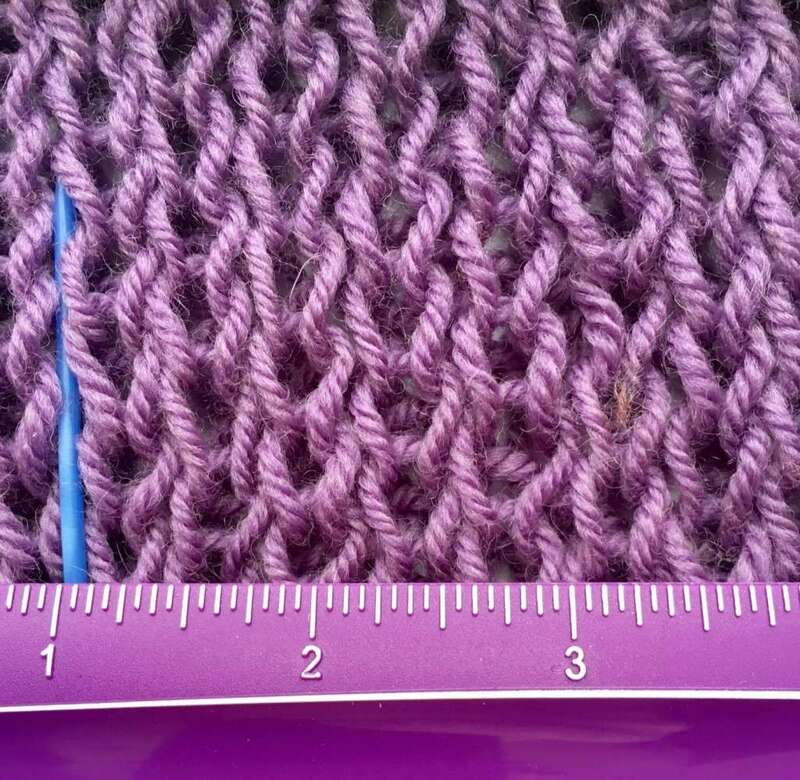 This sample was knit with same #3 DK yarn, but with the spacing of 3cm or 1-9/16″ from peg to peg. So the only difference in this and the previous one is the size of the stitches. The blue needle is marking the first stitch so you can see that there are only 2.5 stitches for each inch of knit. So, to get the same 4″ of knitting, you would cast on just 10 stitches. If you worked with 16 stitches, you would get a wider piece of knit. 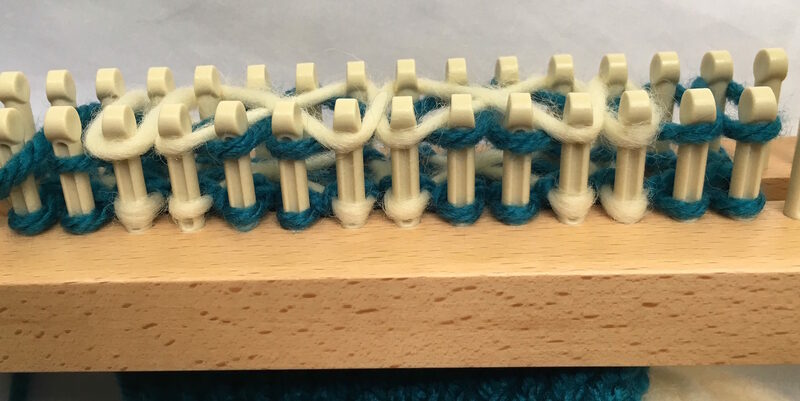 You can also see in this sample that the stitches are much looser so it will create a more open weave; it is not solid, as you can see the white background behind the loops. This setting makes really soft, loose knit scarves and shawls. Now, let’s look at the difference with the same setting of 3cm on the loom, but use a #6 bulky yarn. The openness closes up and the knit is solid and bulky. Great when you want to achieve that chunky look and the extra warmth. As you can see, there are only 2 stitches for each inch. If you still wanted a 4″ scarf, you would only need to cast on 8 stitches. This thick, bulky knit is really trending now in scarves and hats and warm afghans. Knitting at this gauge goes really quickly also. What if you want to do a lacy, open weave scarf, but you like the concept of doing it in double knit? Can that be achieved with a knitting board? Just look at these samples…is this what you were thinking about? Again, this is using the more open spacing of 2cm, which is 1.25 inches from peg to peg, but choosing to work with a very fine #1 yarn, and #2. You can achieve a very lacy look with ‘fluffy’ yarns as well in #1 and 2 weight yarns. This yarn is Lion Brand, Sock-Ease in wool/nylon, #1. Here is same setting of 2cm with #2 sock yarn. So, we can see that there are many looks to achieve with double knit, just as there are in single knit, and knitting with needles. This is why most patterns, that may seem intimidating at first, will always give you 4 ingredients: one is how the project will look when completed, two is the loom that was used and how it was set up, three is the yarn that was used, and forth is the gauge that was achieved, or, how many stitches = one inch of knitting. Next month, we will look at the some of the ways to cast on the loom, bind off, and some basic stitches. 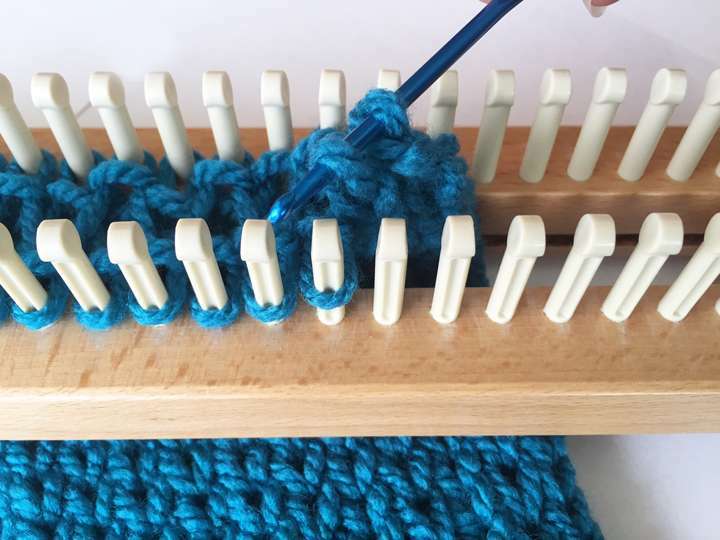 We will explore some little tips for getting going with the great hobby of double knitting on a knitting board loom. We’ll also look at a simple pattern using those techniques. Great article Pat. Really explains the difference in spacing and use of yarn in spacing. Although I double knit all the time, I can always learn new things. Thanks for sharing with everyone. Can’t wait to see the next one. Hi Colleen, doing a swatch for checking gauge is always boring, but saves so much ‘error’ in the overall project. Yeah so true. 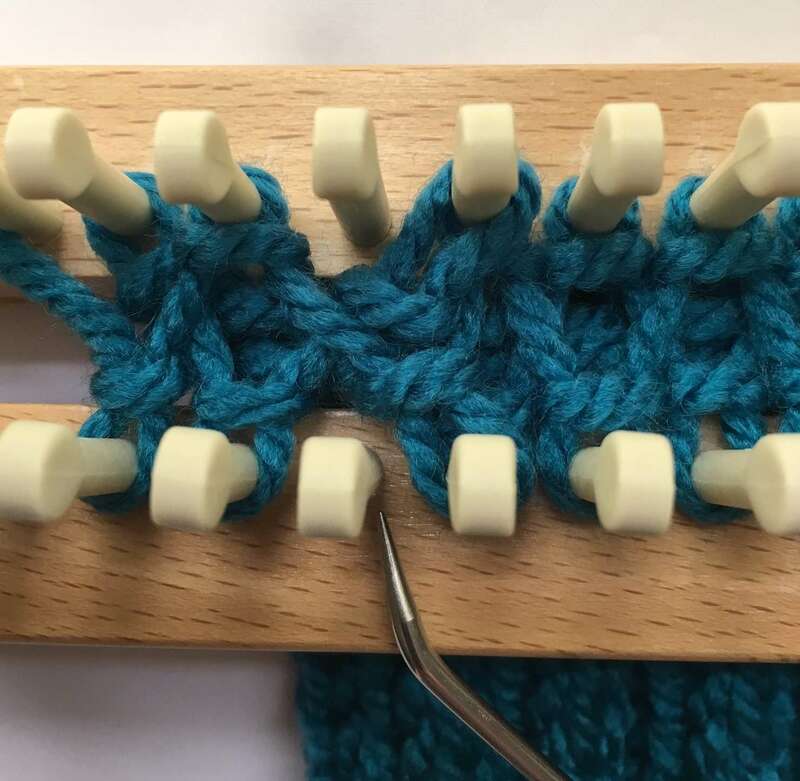 I think I will attempt a gauge swatch next project, your article made it seem pretty simple to find gauge for double knitting 🙂 Thanks! I’m so glad you’re talking about double knitting! Aside from your website, it’s very hard to find good information that isn’t confusing. I hope you consider at some point doing more with cables in double knit. Cables are so popular right now, but with the exception of your basic cables video, there is very little information for double knitting. Thank you Pat for this great tutorial. I like how double knitting looks and want to learn more. It’s great that you started from the basics and I’ll follow this topic for sure. I know that these are more advanced topics, but I would love to learn about color work and brioche using the knitting boards. Is there a possibility in the future? Just found your 101 double knitting entry. 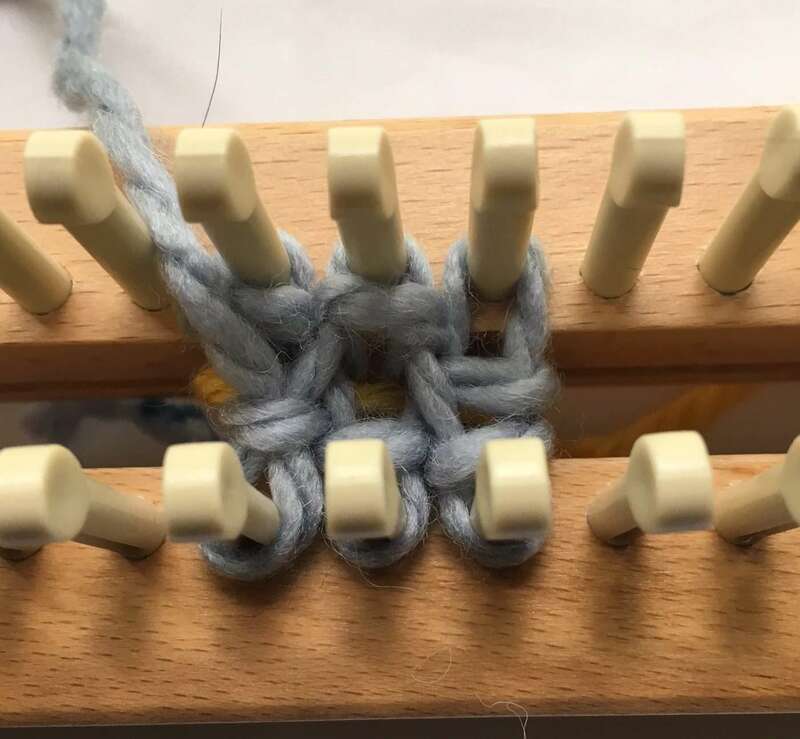 I have been working on loom knitting technique for about four years. I have learned a lot from this site on both single and double knitting. Thanks for the comparative presentation of the various settings. The biggest challenge for me is to incorporate increases and decreases to achieve shapes and textures. I try to transcribe Barbara Walker’s recipes into loom knitting. May this craft and its practitioners live long and prosper. Beautifully informative. I am looking forward to future postings. Thank you. Thanks for doing this! 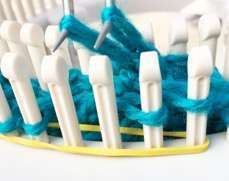 This is my favorite topic in loom knitting. 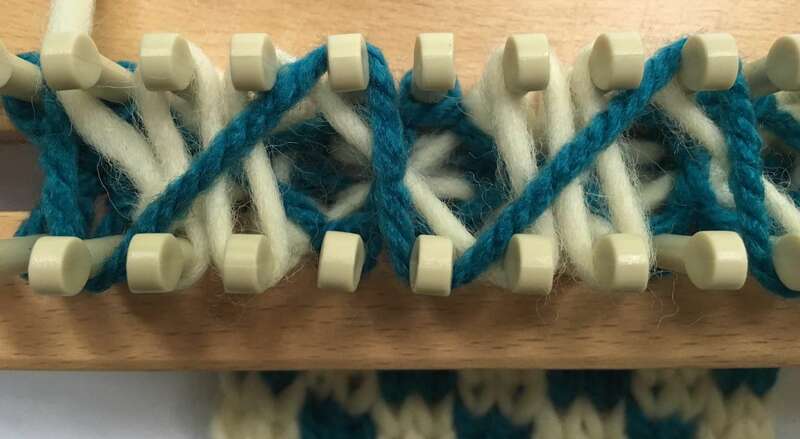 It’s hard to find many patterns and information for double knitting on the loom.I am wondering if there might be a double knit loom-along in the future? Thanks again and I am eagerly looking forward to the next installment!